Sunday was a travel day. We’d planned to get a way a little earlier, but we finally left Augusta around 8:30 am. We stopped at Firehouse Subs and Starbucks near Lumberton, NC. We had a few other bathroom and coffee stops and traffic really got heavy once we were in Virginia. We arrived in Bethesda around dinner time. We tried to eat at a new-to-us place, Bobby’s Burger Palace but they were out of beef (???) so we went to the nearby Five Guys. 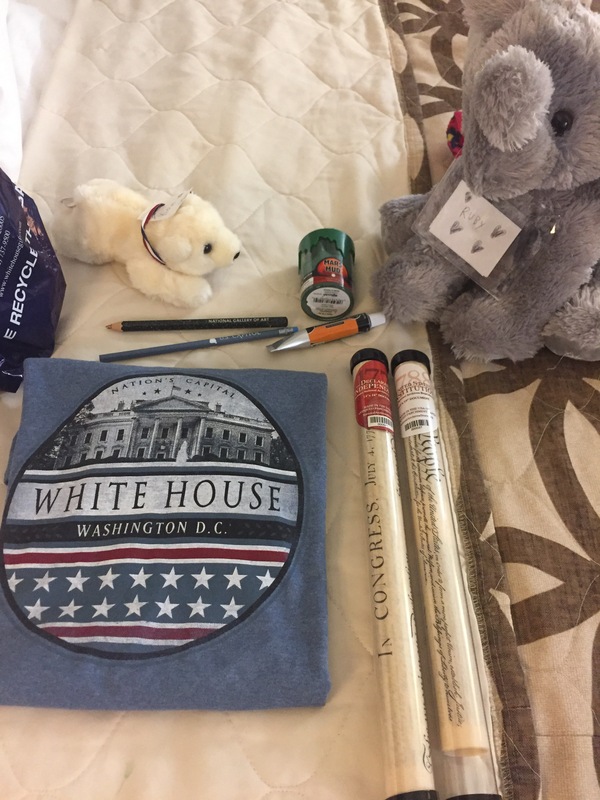 We got checked into our room at the Navy Lodge on the Walter Reed campus and started more closely planning our sight-seeing and Metro routes. We left the hotel by 8:00. 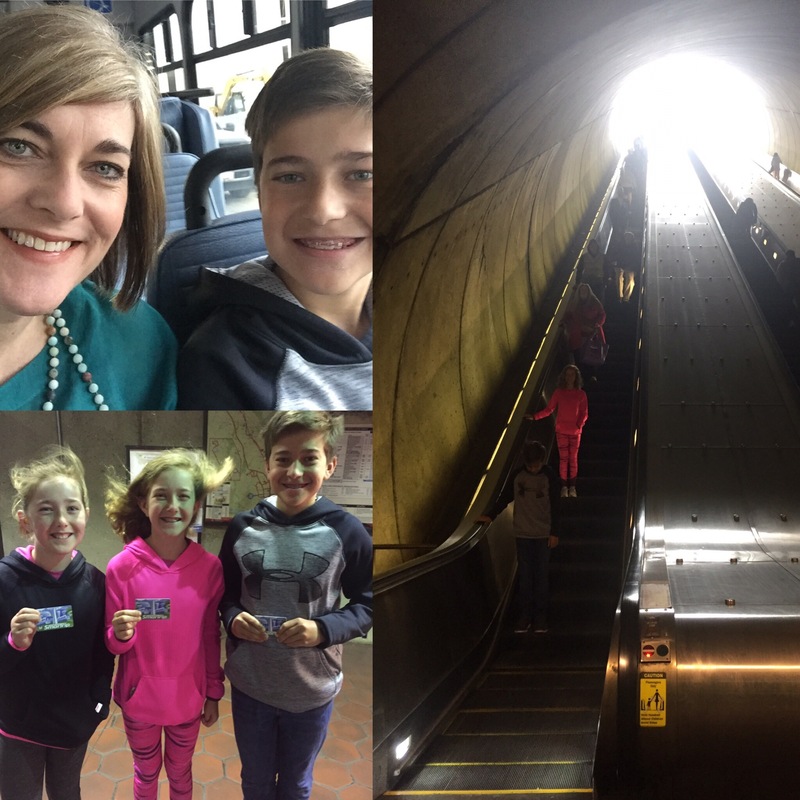 We loaded up our Metro cards and made our way toward the National Air and Space Museum, which was a high priority on our list of attractions. By the time we arrived off the Metro we had about half an hour to kill before the museum opened so we piddled around the National Mall area taking it all in. 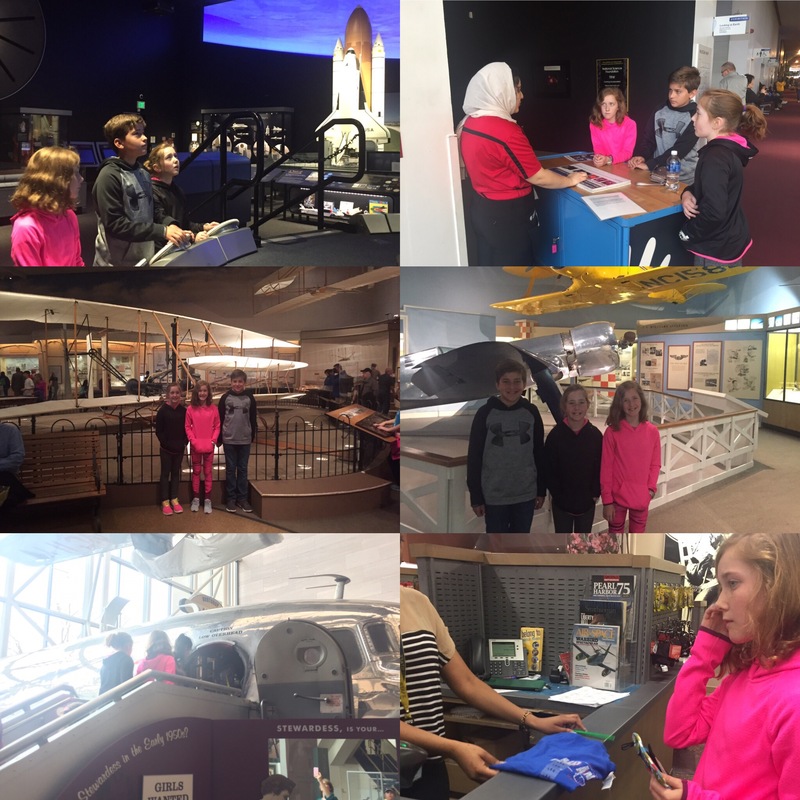 The Air and Space Museum did not disappoint. Our kids absolutely love science! We have seen many other space museums (Alabama, Tennessee, New Mexico, and Georgia) but never one to this level or degree. It’s weird because we have loved all of those other museums but this one was just on a whole other level. You might even say it was out of this world. 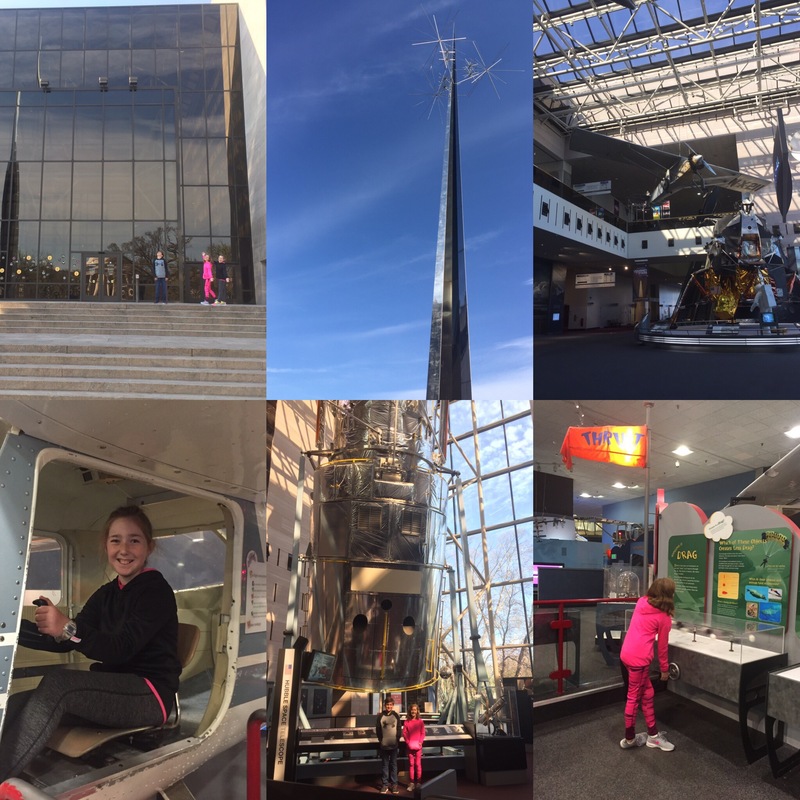 My girls have studied Apologia’s Astronomy this year so the museum visit was especially relevant to them. From there we walked to Plan B Burger Bar for lunch. 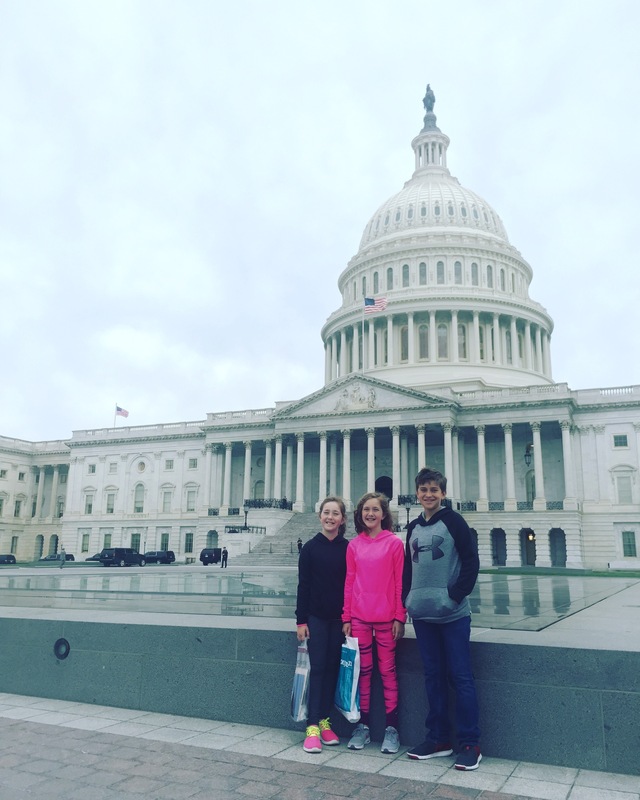 We ate and hustled back down to Capitol Hill for our prescheduled tour of the Capitol. It was fun and we had a great tour guide with a fun sense of humor. 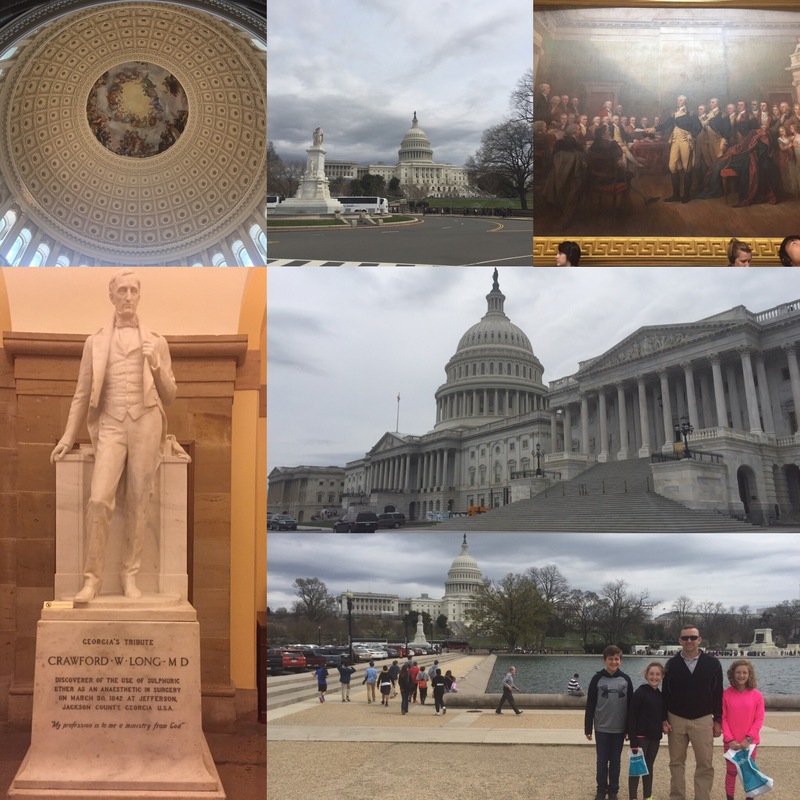 The statues were amazing and the rotunda was breath-taking! The kids were clutch answering all of Vernon’s early U.S. history questions. After our tour we walked downstairs for drinks and a cupcake in the cafe. We decided to walk to the Senate office buildings to get passes to sit in on the Senate gallery. There was actual legislation and a vote on the floor. We literally watched history being made. Being in the Senate buildings was cool! We met some of Bob Corker’s staff, including a fellow UTC alum! (She taught me the Power C!) Ryan caught up with a fellow Army pal from his 6-1 Cav days. 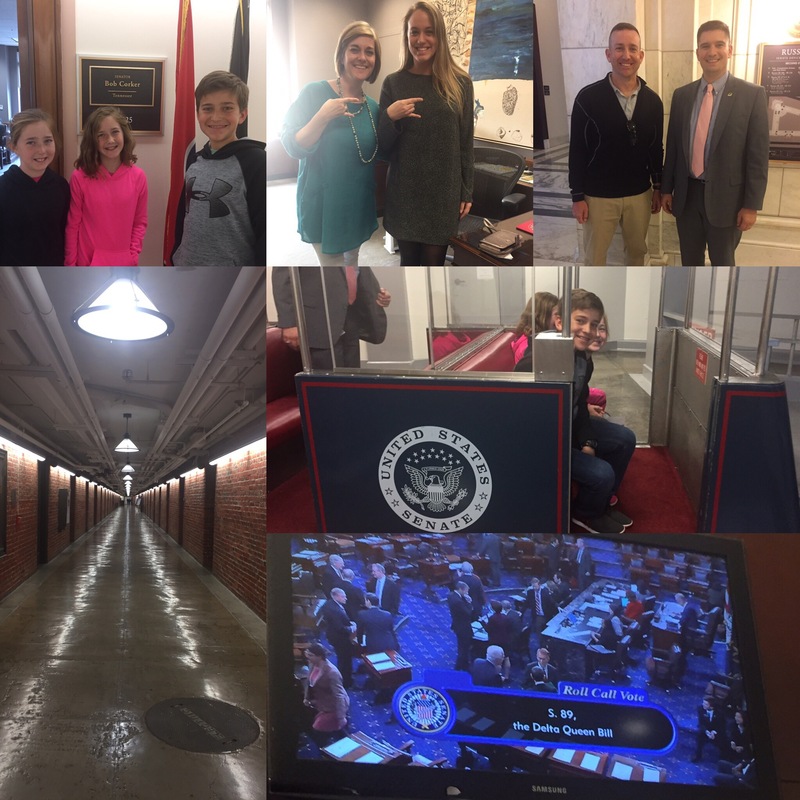 Patrick works on Capitol Hill and hooked us up with an impromptu “underground” tour of the tunnels between the Capitol and the Senate offices. We got to ride the senators’ underground trolley back over to the Sentate. We got to watch all of the U.S. Senators vote on legislation to pass a bill to have the Delta Queen, America’s last authentic steam boat back up and running on the Mississippi River. It has been deemed unsafe and in need of repair for years. There was a Chattanooga connection as the Delta Queen spent many years parked at Ross’s Landing. It was cool to see Bernie Sanders, Ted Cruz, and Little Marco, all early presidential candidates. We also saw John McCain, Elizabeth Warren, Lamar Alexander, Diane Feinstein, and Claire McCaskill who authored the bill. Despite what the media tells us about the hatred between parties, everything looked jovial and civil from the galleries! We heard the Senate roll call and voting for the bill and we went on to dinner from there. We ended up at Rosa Mexicano which put us steps from the Verizon Center and a Metro stop for the ride home. Our kids got to see many street performers and were awed by their talent. 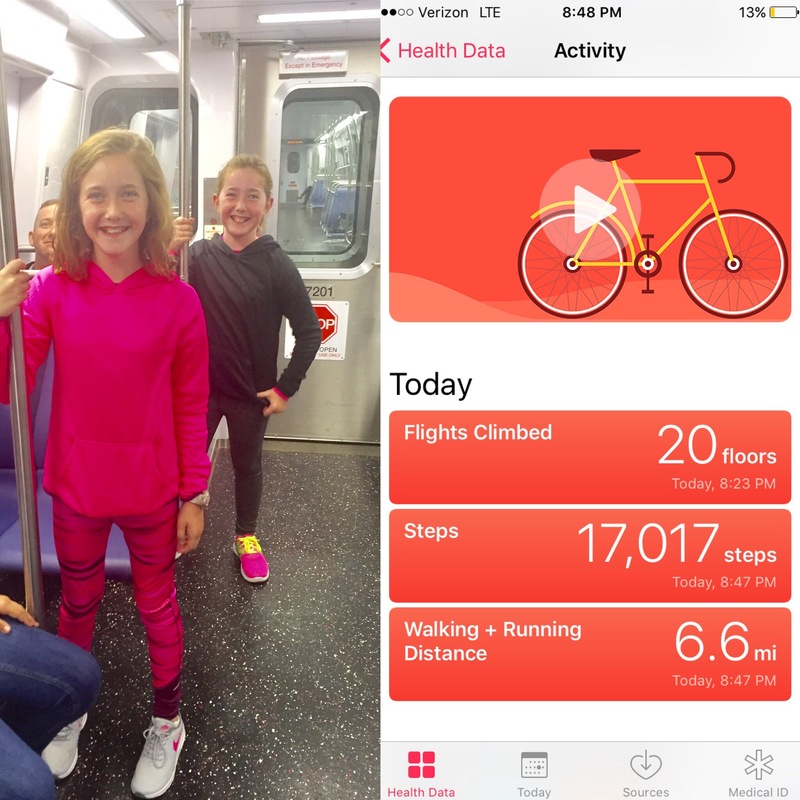 By the end of the day, the girls were such independent Metro pros*, they stood up the whole ride back to Bethesda! We covered a lot of ground on our first day. We were pooped and ready for showers and bed once we returned. We were back at it for another early day on Tuesday. The girls decided to carry their fanny packs with their Metro cards, chapstick, snacks, and their souvenir money. 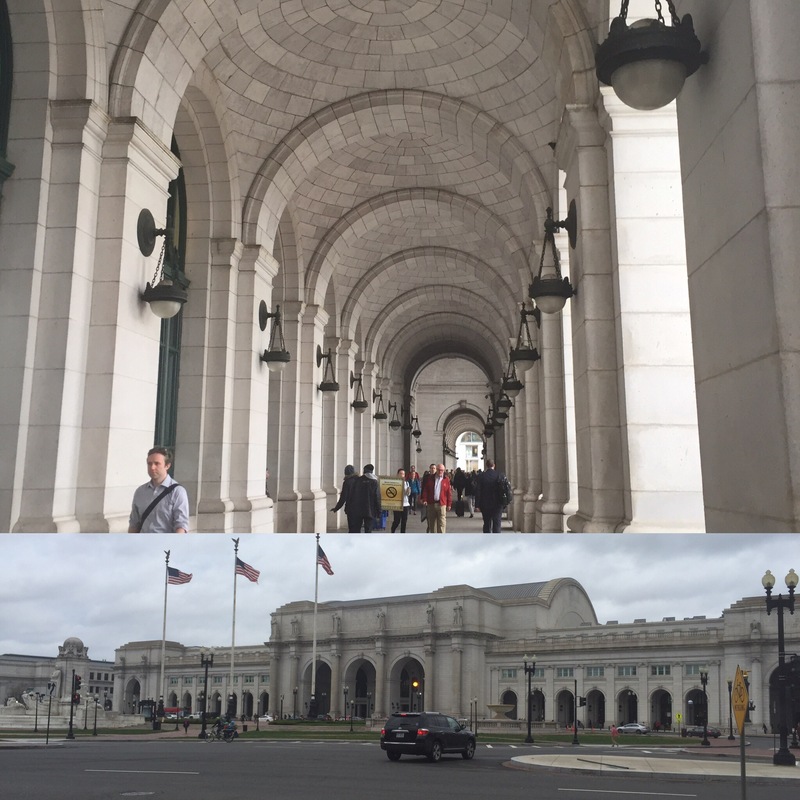 We rode the Metro in fairly early and arrived at Union Station. It was crawling with people. Huge and daunting, it’s one of the city’s major hubs. 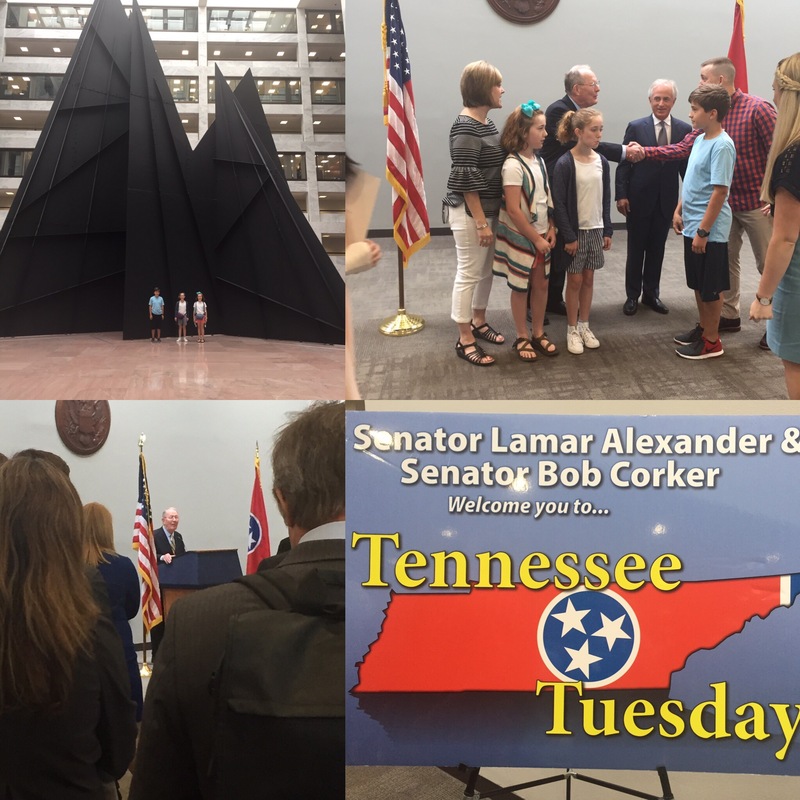 We went back to Capitol Hill for a breakfast called Tennessee Tuesday where we were able to meet, mix, and mingle with Senators Alexander and Corker and their staffs. We had just enough time to squeeze in the National Archives before lunch. 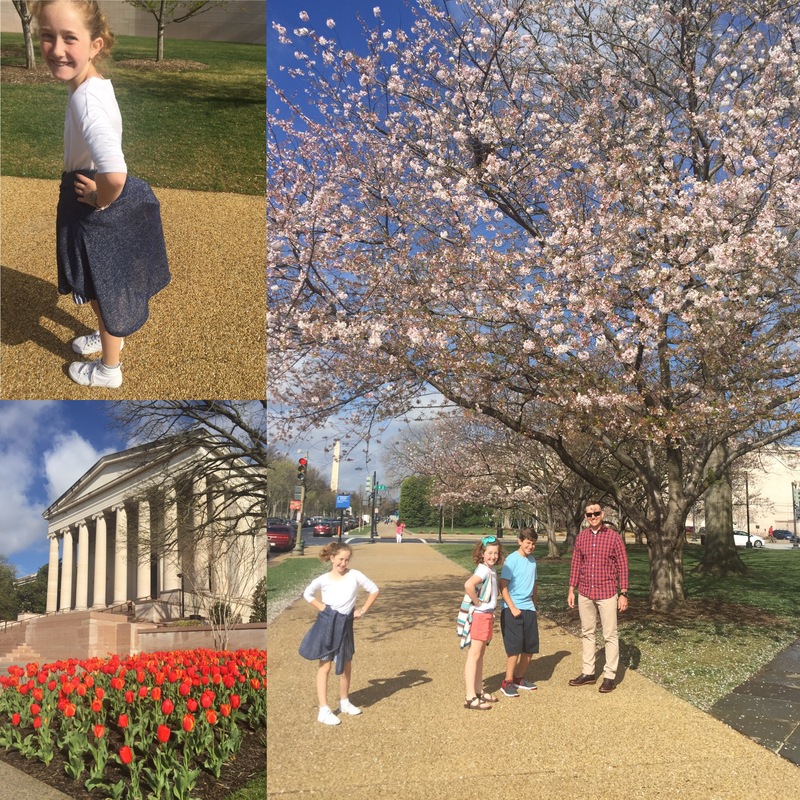 The weather was great and we enjoyed waking down the Mall area. There were a few remaining cherry blossoms and many beautiful tulips! 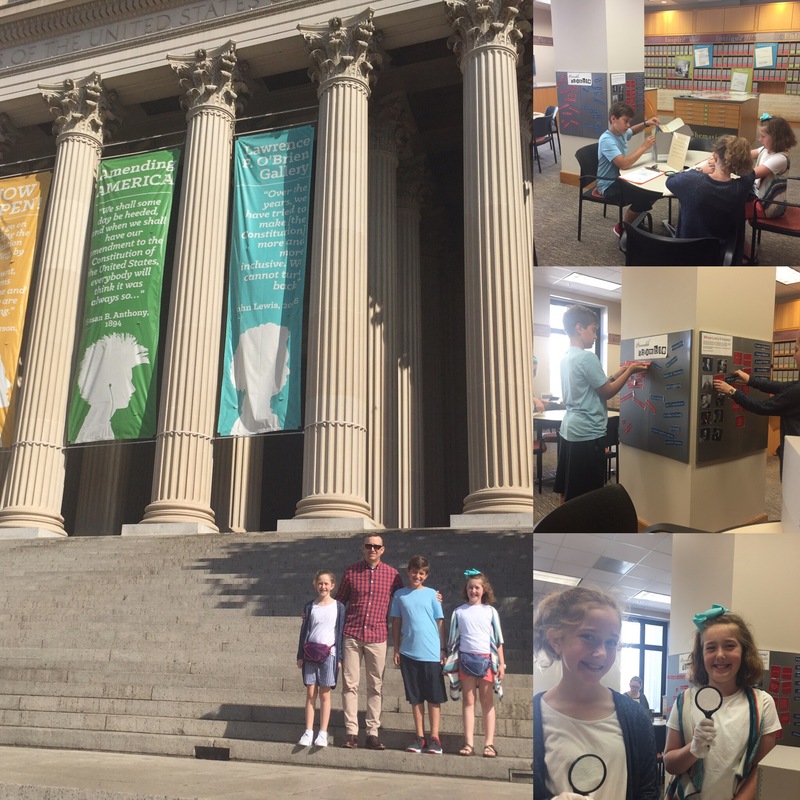 There were no photos allowed in the Archives but we enjoyed seeing the Bill of Rights, the Constitution, and the Declaration of Independence. I was able to get a few photos of the kids in the Boeing Learning Center. They often needed a break from the main galleries at many of the museums. It was nice to go sit and play in these smaller (quieter) areas designed for kids. After spending a few hours here it was time for lunch. 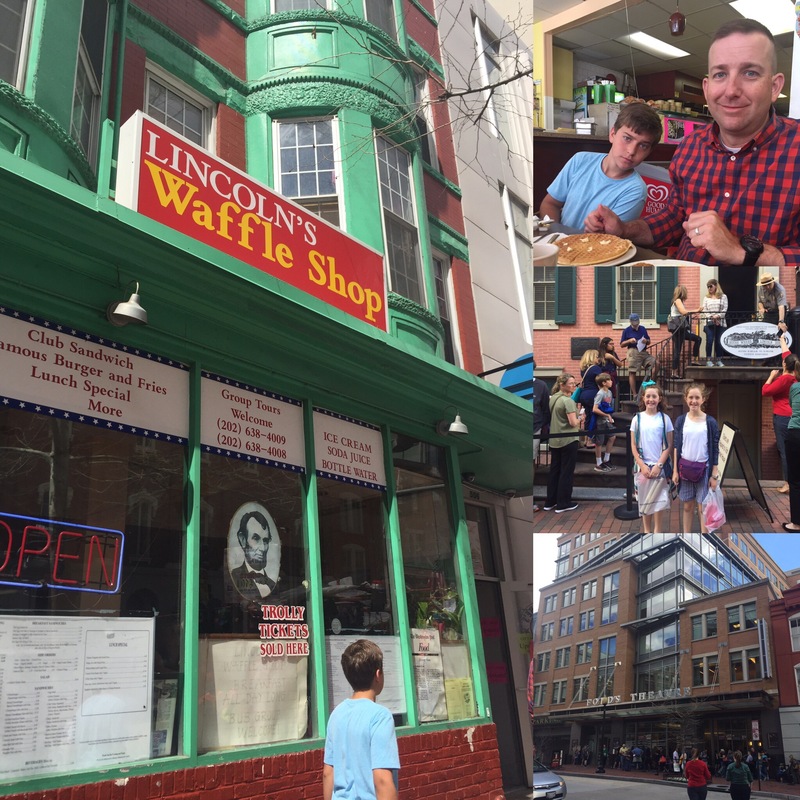 We walked to Lincoln’s Waffle Shop which was by far the dumpiest, most “dive-like” place we ate. However, our food was delicious. While on that street, we saw (from the outside) Ford’s Theater where Lincoln was shot as well as the Petersen House where he later died. The crowds here were insane, but I would have loved to explored both of these sites in more detail. We spent the afternoon at the American Museum of Natural History. Whoa! What a crowd there. 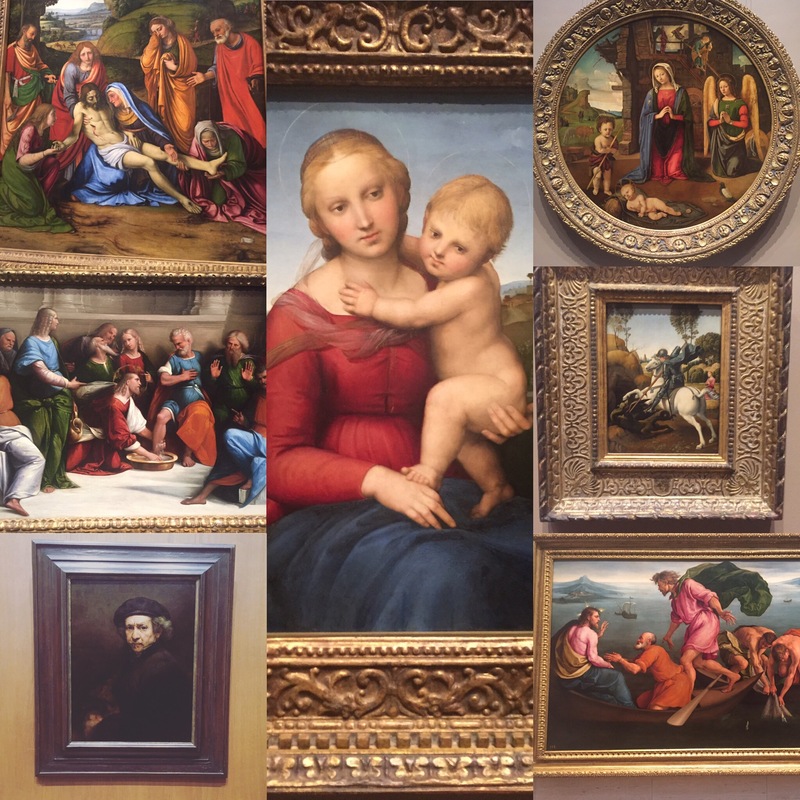 You could spend several days seeing each exhibit within the Museum, but we had to hit the highlights. 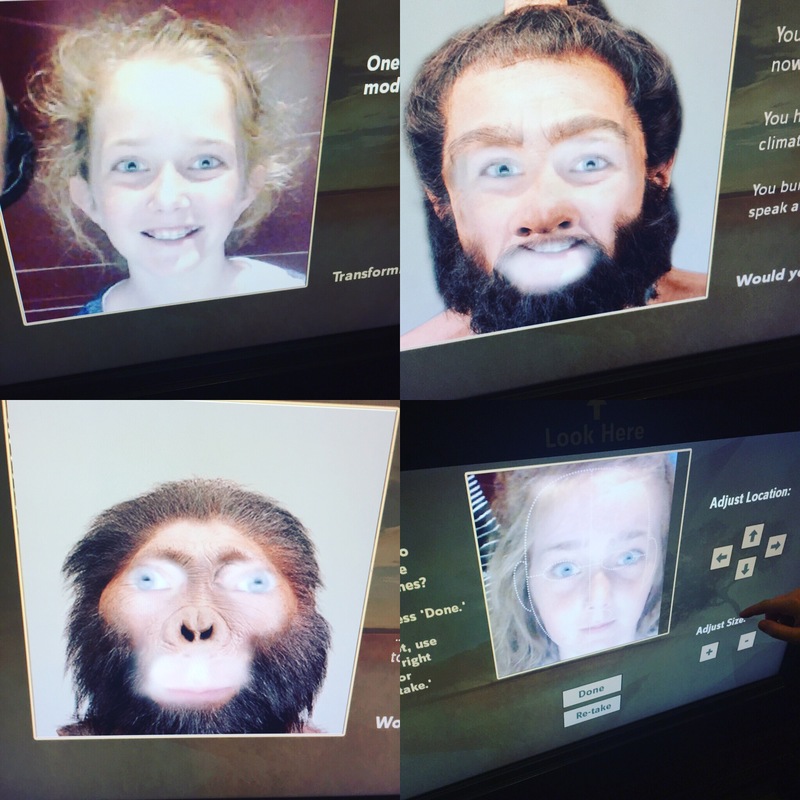 Mae and Kate got a big kick out of the Human Origins interactive exhibit. 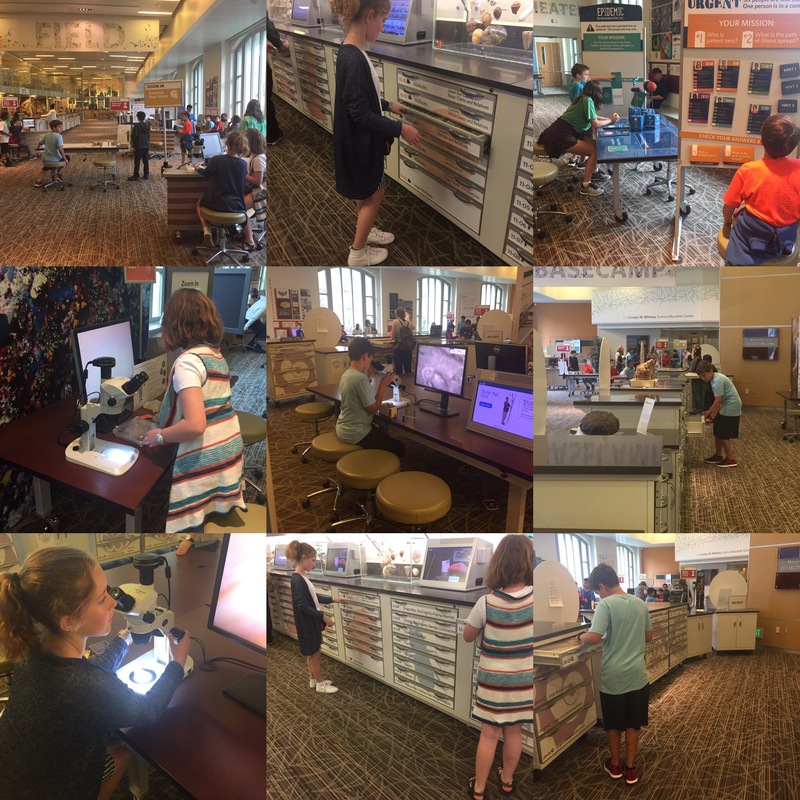 By far, a highlight of this museum was the Discovery Room, learning lab for kids. Aside from some cool, smaller table exhibits, there was a separate area that had over 6,000 catalogued items from each of the nine exhibits. 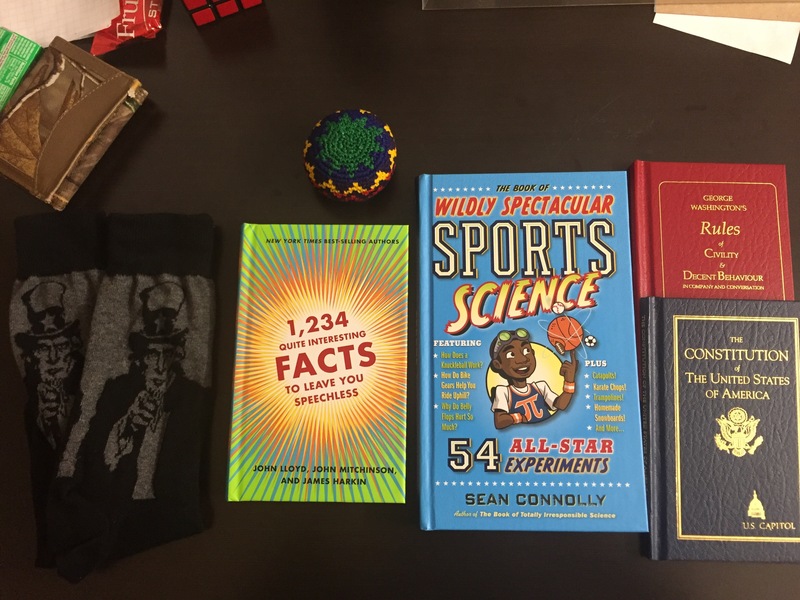 Many of these items could be removed from their display cubes, handled, placed under a microscope, and every item had a scannable QR code. The kids spent almost a half hour here, giving Ryan and me a chance to sit down and rest our aching bodies. There were no large (unsupervised) school groups allowed in here so it felt calm and quiet unlike the rest of the museum. This museum is another perfect example of a D.C. museum so vast, that we probably only scratched the surface of its awesomeness. We were all pretty worn out at this point. We all regrouped with a drink from the cafe and began making our way toward the Metro in hopes of beating the rush hour crowd. 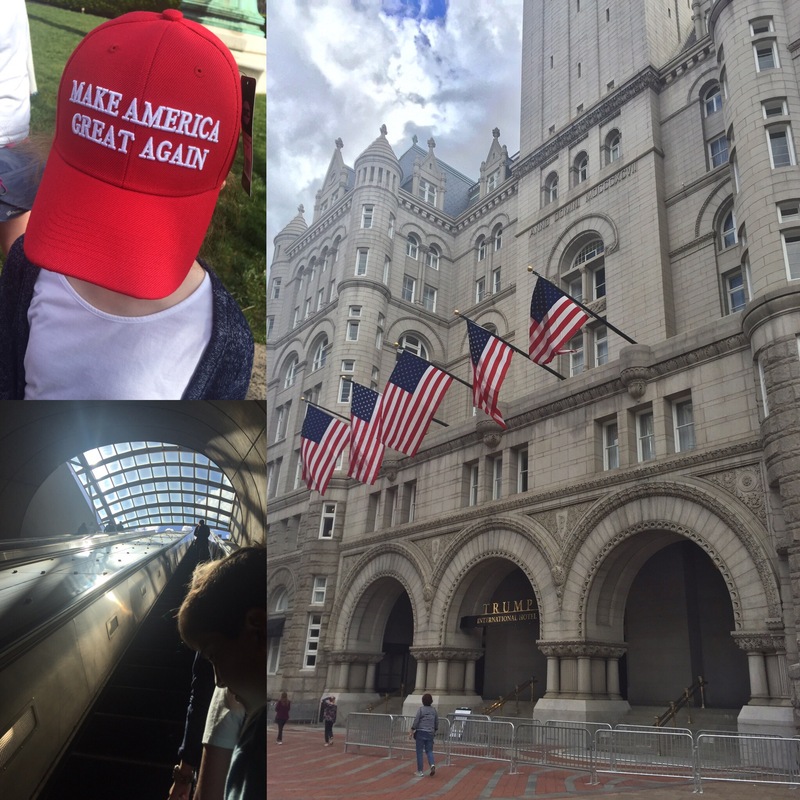 We saw the Trump Hotel and may or may not have bought a hat for my dad, who voted for Trump. We were grateful to time our exit from the Metro with a quick meet up with a Chattanooga friend. Joseph was a former student in our youth group in the old days. He’s now working at the National Institutes of Health doing a fellowship before he starts medical school in the fall. He gave us a great dinner recommendation, Pizzeria Da Marco, in Bethesda. 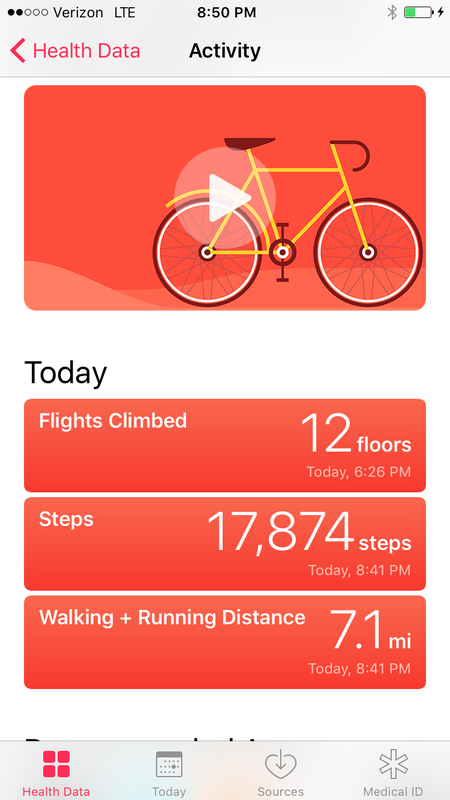 Another full day of fun and walking. We called it an early night and got some extra rest. *As I finger type this from my phone (hoping to update each evening while my memories are fresh), I am laughing on the inside. We didn’t set an alarm for this morning. We were all worn out and knew we needed an extra hour or two of sleep. We missed rush hour which was another bonus. 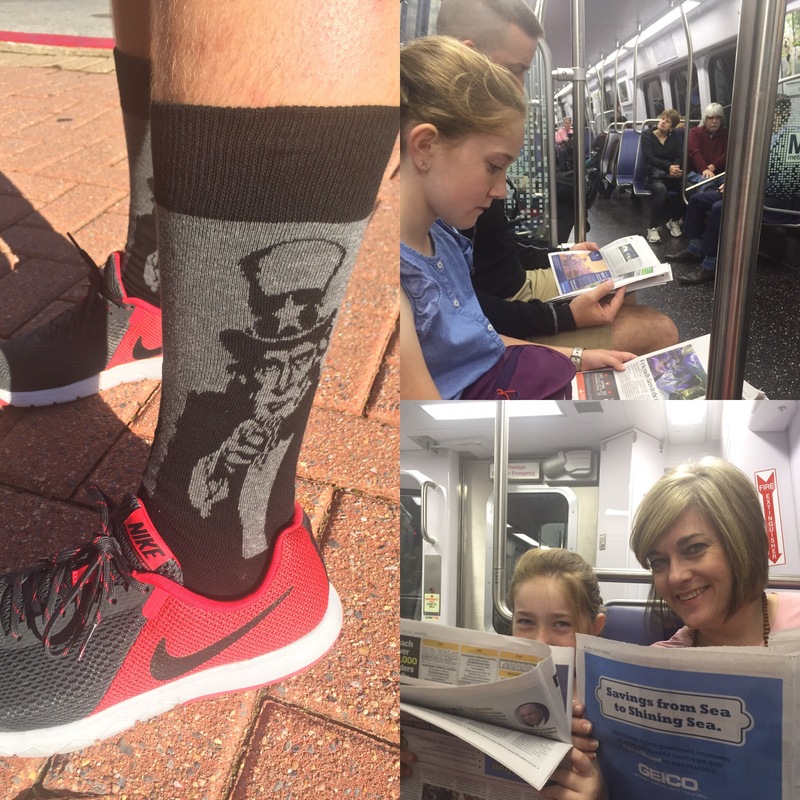 Thomas was sporting his Uncle Sam socks he bought at The Archives. We finally made it to the Metro around 9:30 and added more $$$ to our cards. On our third ride into the city, we were like local-yokels reading The Post on our morning commute. I told Ryan that the Metro is the introverts’ dream. NO ONE SPEAKS to ANY ONE ON THERE. 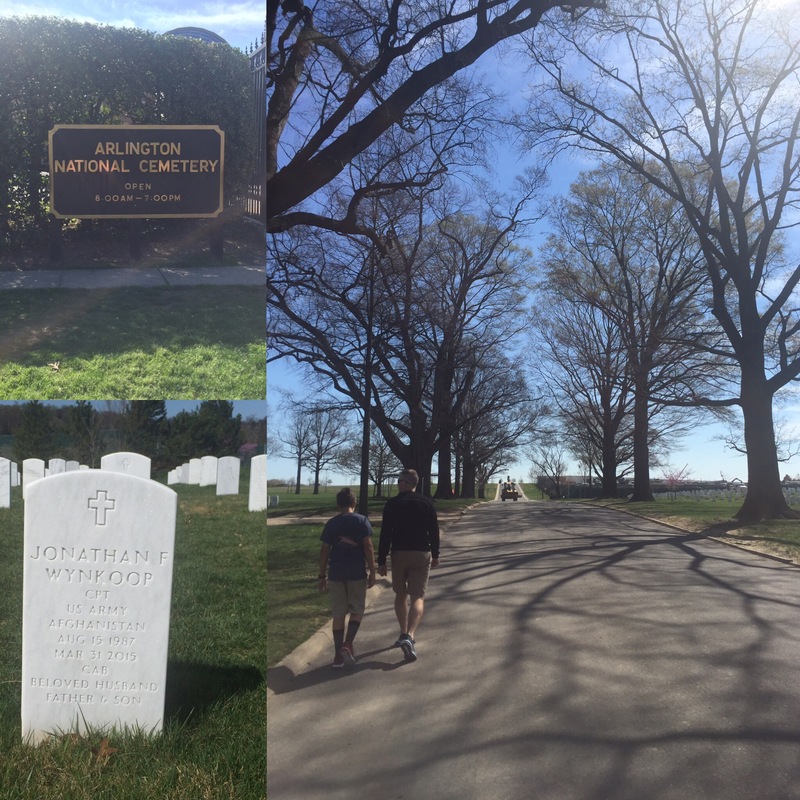 We took the Red Line to the Blue Line and rode out to Arlington National Cemetery. My tears started before we even walked through the gate. It was a high priority to visit the gravesite of a fellow 6-1 Cav fallen hero, the late husband of a dear friend. 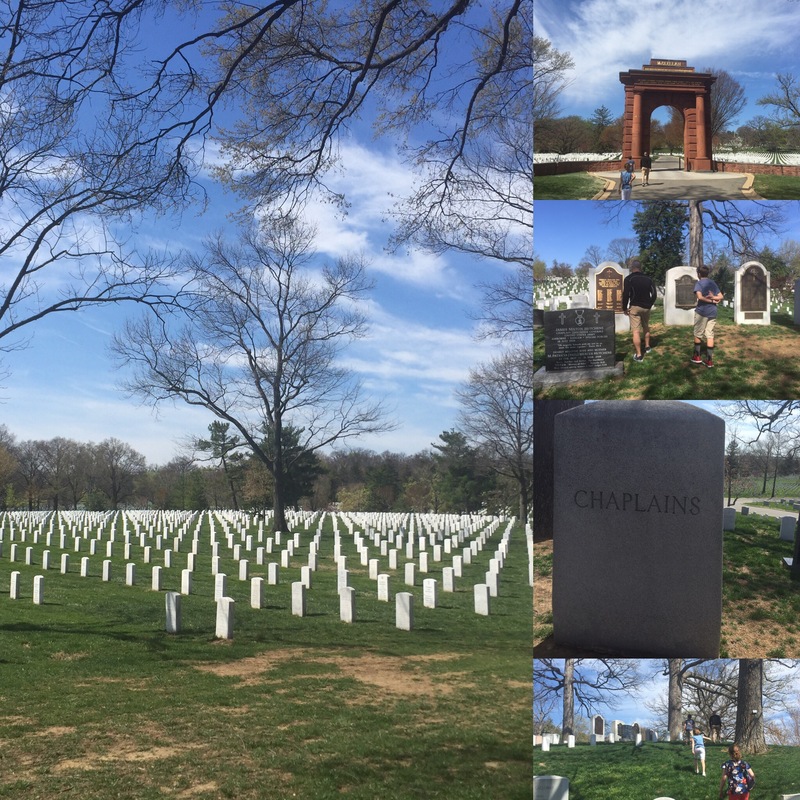 The ANC Explorer app made it a breeze to quickly locate and navigate finding specific graves. Arlington is a solemn place. There were graveside services going on and we saw a processional that included what we surmised was the Old Guard Band. 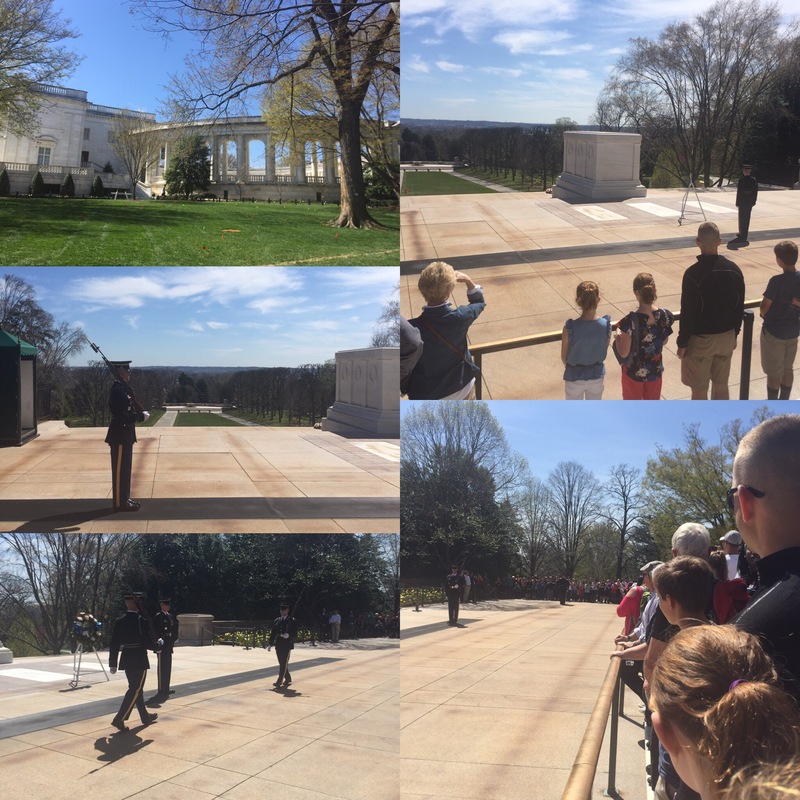 We finally made it up to the Tomb of the Unknown Soldier and the changing of the guard. What ceremony! If you’ve never been, there are very strict regulations about noise, standing, and paying respect. A man hung his coat on the chain rail and the guard literally called him out and when he did, he changed the position of his gun and popped off one of his own medals. It was a whole other process for someone to retrieve his medal and return it to its proper place on his uniform. 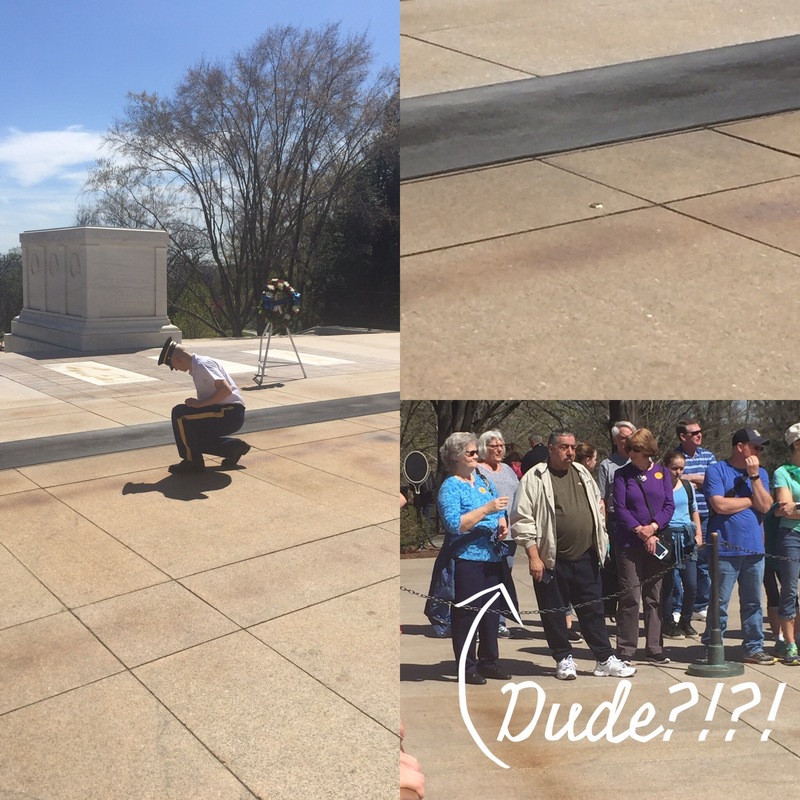 Everyone was staring at the guy who derped and he finally just put his jacket back on! In the photo even the lady to his right is looking at him! It was a long morning at Arlington so by the time we rode all the way to the Eastern Market Metro stop we were famished. 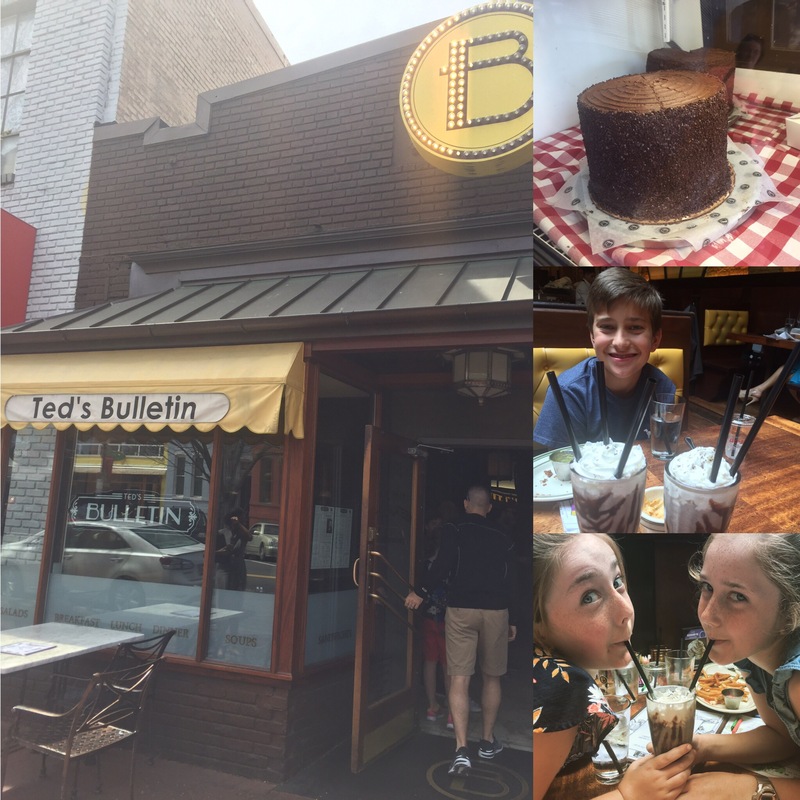 We ate a late lunch at the highly recommended Ted’s Bulletin. There was definitely a different vibe in this neighborhood (as each one has its own). I’d have loved to spent more time exploring, but we hopped back on the Metro and went back to the Mall area. 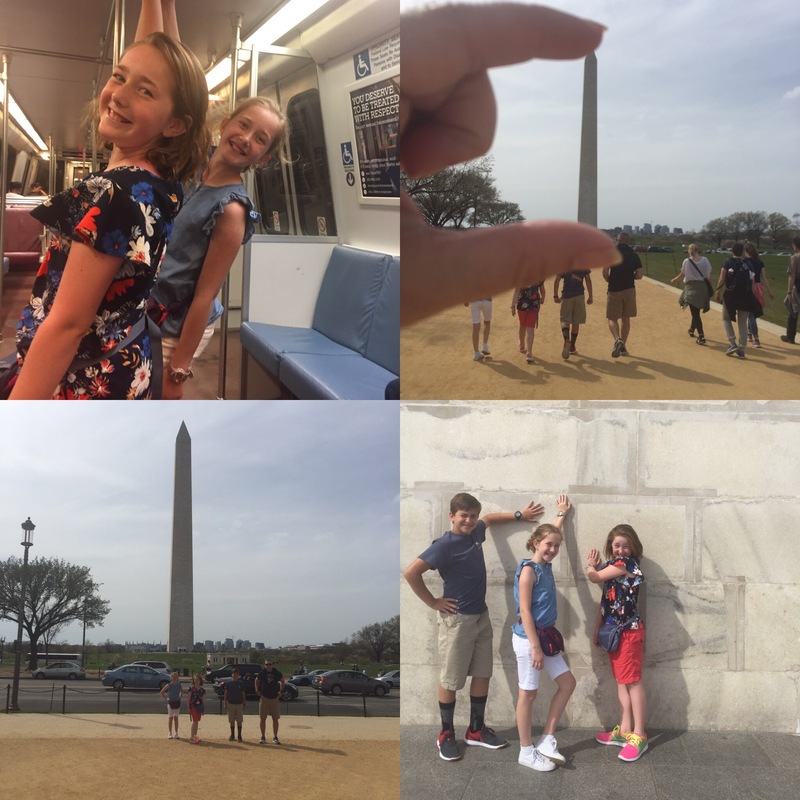 We started near the Washington Monument. 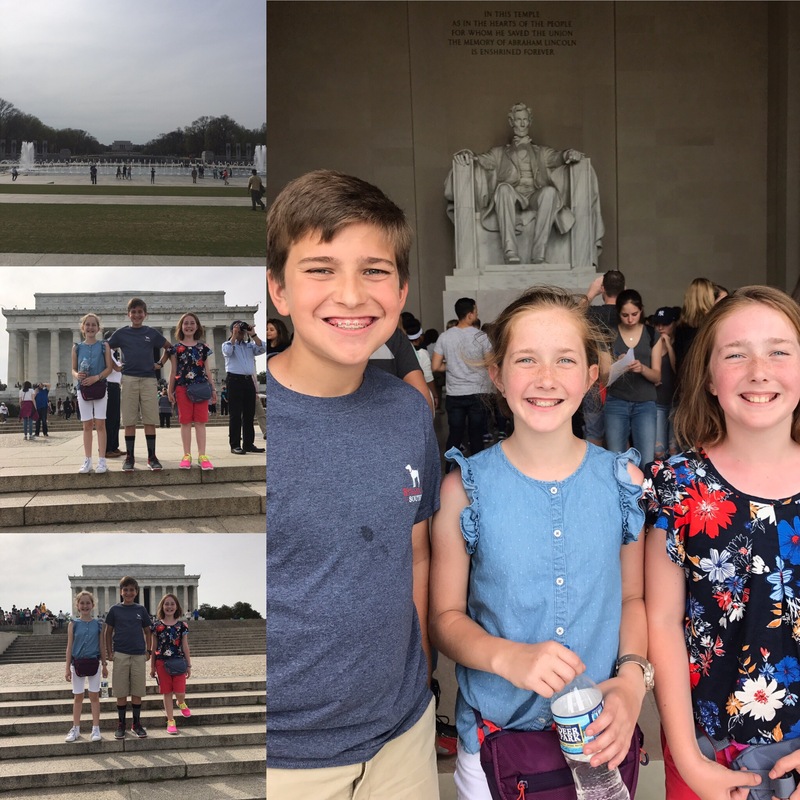 From there we did the big loop to all of the War Memorials (World War II, Korea, and Vietnam) and ended up at the Lincoln Memorial. The White House was next. Our pre-scheduled tour was cancelled from what we surmised may have been the visit from the President of China. Instead we got the south lawn and frontal views. We even bumped into my childhood bestie and neighbor, Cortney, who was with her dad and daughter. At this point, at the end of three very long, very full days, we took ourselves back to the Metro and planned to eat out in Bethesda again. We tried California Tortilla (a more expensive version of Moe’s). We knew we were outrunning the rain all week and thankfully came prepared with wet weather gear. Thursday had a 90% chance of rain and high winds. 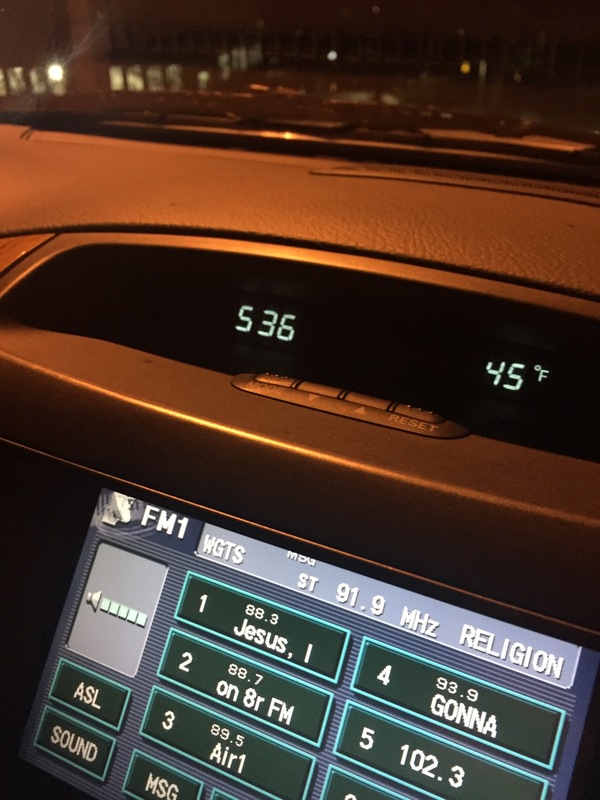 We were so tired Wednesday, we even debated driving back on Thursday due to the forecast. I’m glad we didn’t! It was a great day! We plotted our day to involve as little walking between attractions as possible and time + the weather was on our side. We somehow dodged all of the main heavy rains. We were indoors when it was pouring and managed to have breaks in the rain when we needed to walk to the next stop. 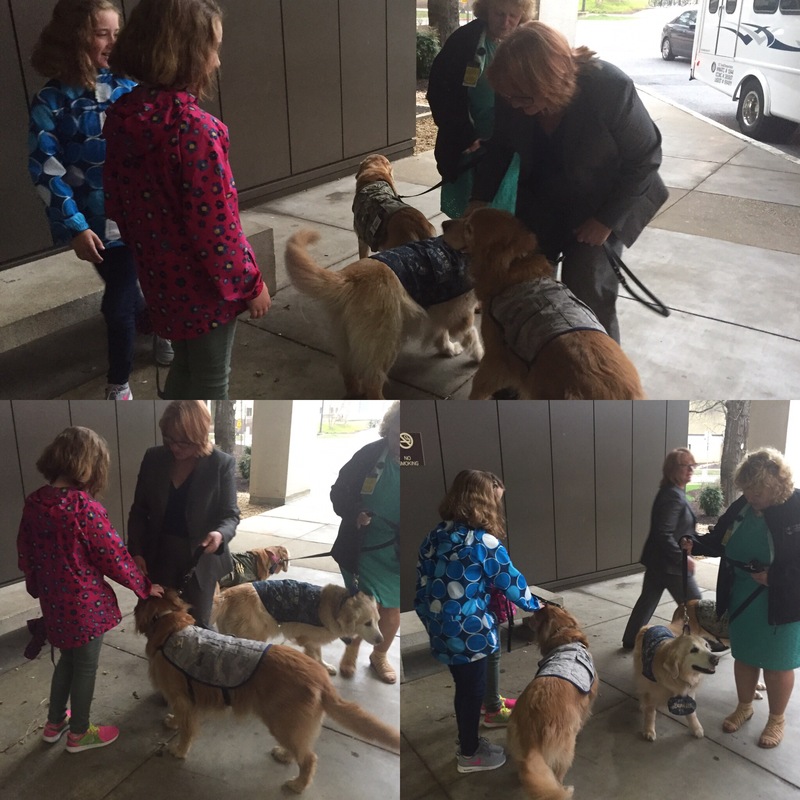 Kate and Mae were so happy to get to visit with some of the military working therapy dogs while we waited for our shuttle at Walter Reed. 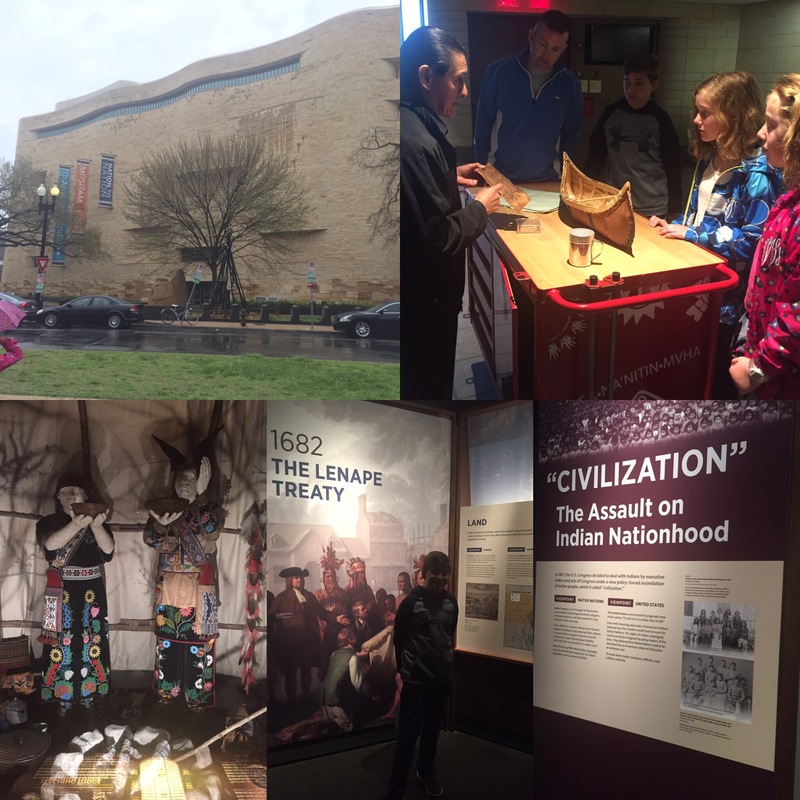 We got right to the Metro just after peak hours, walked less than 10 minutes in the rain and and arrived at the National Museum of the American Indian about 15 minutes before it opened. 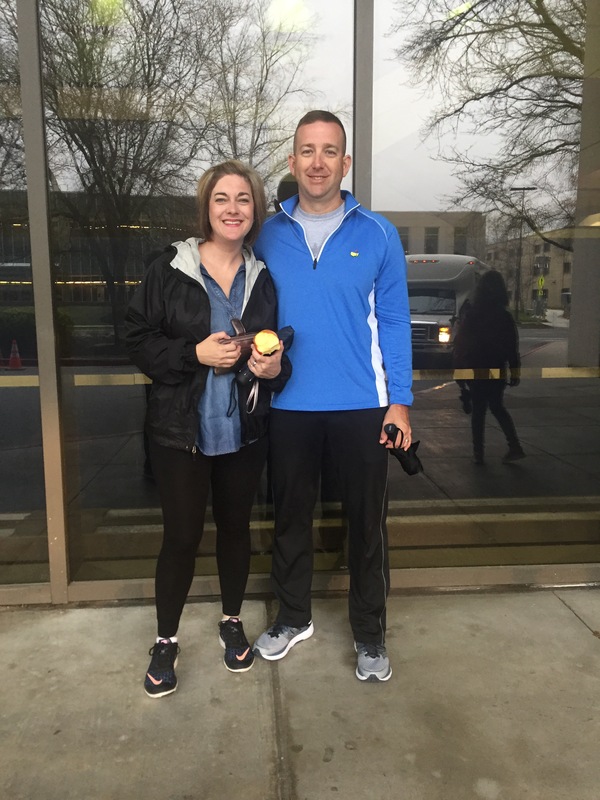 We talked to a mom and daughter who happen to live in Augusta, also visiting during Spring Break. 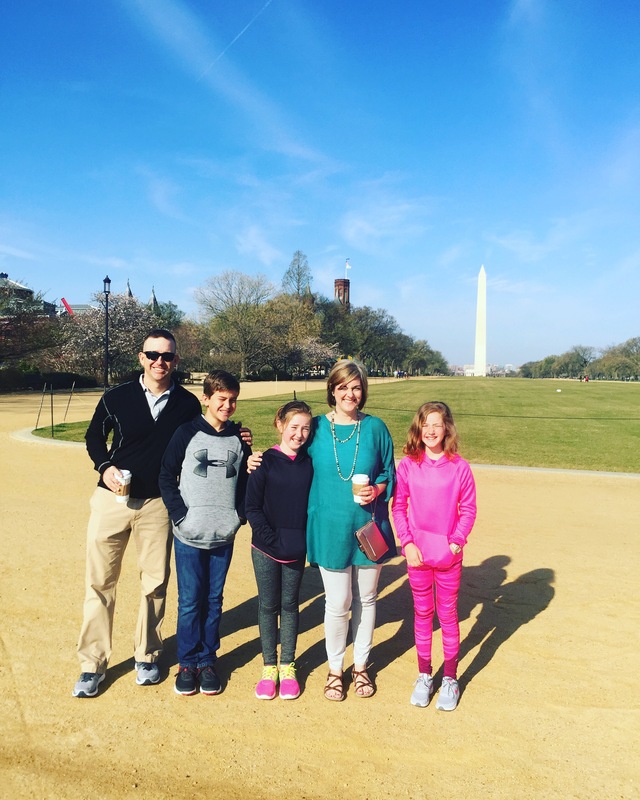 Her daughter attends Westminster and mom teaches at AU. Small, small world. This particular museum isn’t one you typically hear people raving about. I’d say it was our most pleasant surprise of the whole trip! It was delightful! I’d go as far as to say that this is a perfect museum to start with. Historically speaking, this museum puts the rest of our nation’s story into proper context. This was also one of the BEST kids’ areas we visited. (This is partly true because of my “school group fatigue” as they don’t allow large groups into the area without advanced reservations.) The imagiNATIONS Activity Center had a fun little passport stamping activity for the kids to complete. It was a great half-hour spent really cementing what the other museum exhibits had shown. Another bonus was the fact that this museum has one of the highest rated cafes of any of the museums. Although pricey, the food was amazing. Also, we were able to stay in the same building for lunch instead of walking in torrential rains. Put this museum and the Mitsitam Cafe on your list. It’s cafeteria style but they offer delicious food that represents the various regions of American Indians. 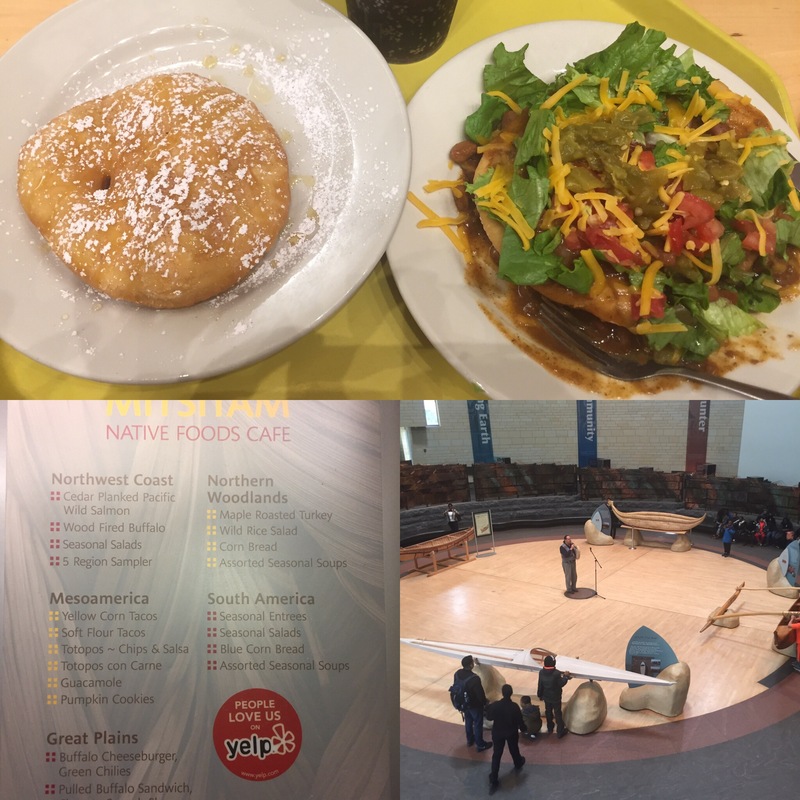 The fry bread was…good with bison chili and toppings as well as with honey and powdered sugar. After lunch, we saw the last few exhibits working our way out of the museum. 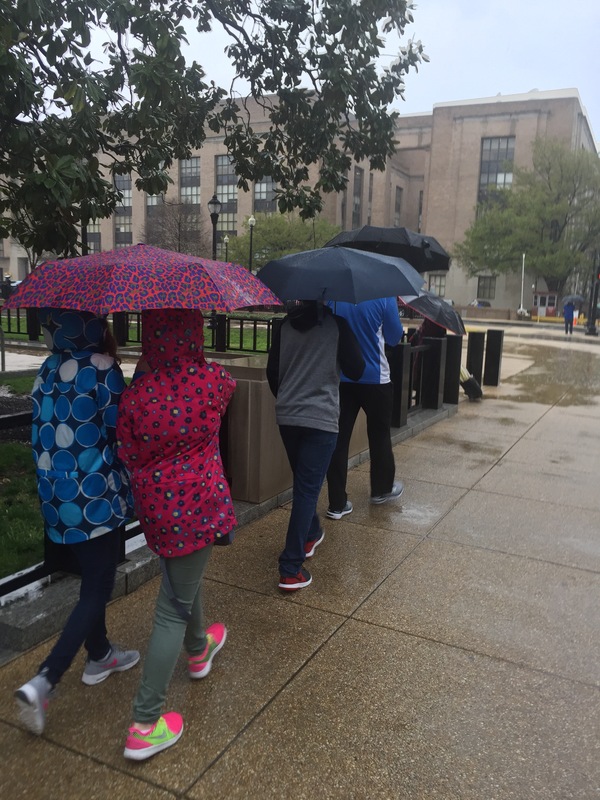 Praise the Lord, there was a break in the rain for our short walk over to the National Gallery of Art. 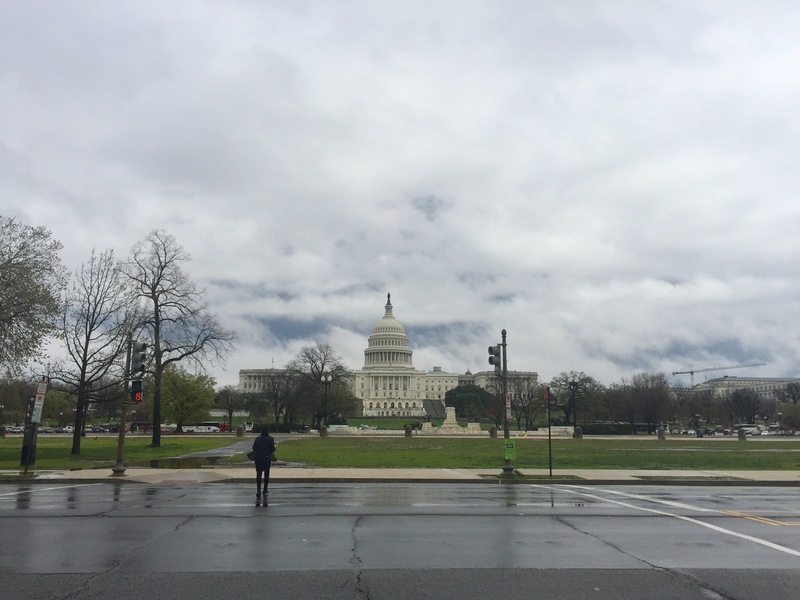 One last view of the Capitol. We very barely scratched the surface of one wing, on one floor, of one building of the NGA. It would take weeks to see and really digest all of the artwork here. 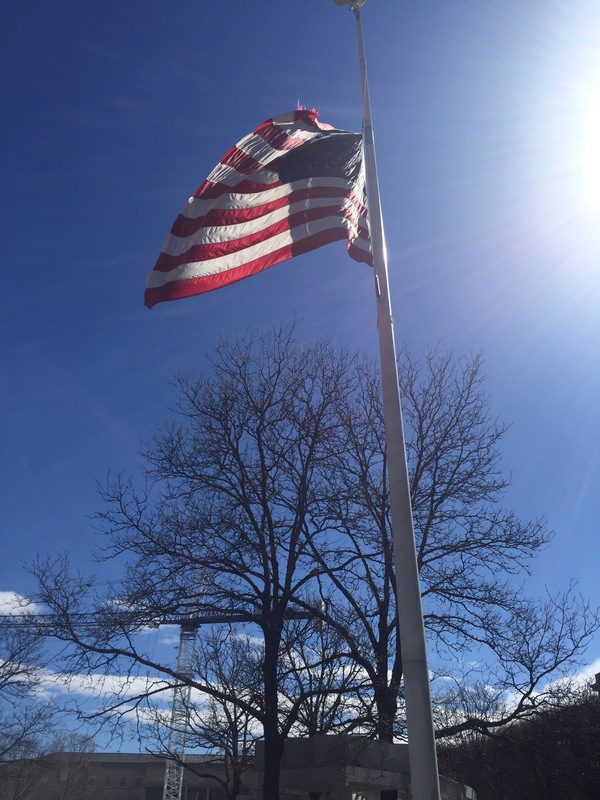 This was my final “city” photo of the U. S. Flag flying at half-mast in honor of John Glenn (astronaut and senator) and his burial at Arlington. We planned to get up and on the road early to hopefully avoid the I-95 madness and get back to Augusta at a reasonable hour. We had intentionally saved a short visit to Mount Vernon en route home but decided to cut that from the itinerary. The weather was super cold and windy, the traffic to get there by opening time was going to be overwhelming, plus we knew we had nearly a 10 hour drive home after viewing the grounds. It just didn’t make sense to try to force the visit. So after a week SUPER full of memory making, family fun, so much history and new information that our heads and hearts are about to explode, I want to take this opportunity to reflect on this trip and offer a few travel tips after having almost a dozen friends respond with pleas for a review. Not to be too political, but no need to make America great again. It has always been and will always be great. Seriously I dare you to walk through the halls of the Archives or the Capitol or the grounds of Arlington and NOT be moved by the greatness of our nation. This country’s greatness doesn’t rest squarely on the shoulders of a single president. Sure, he or she may contribute to it, but the greatness of the United States is made up of its people. We stayed at the Navy Lodge in Bethesda. We picked this place due to its relative proximity right on the Metro line and its $87 per night rate. Military lodging is clean, safe, offers free breakfast, free shuttles, kitchenettes in the room, onsite laundry, among other amenities. We had a standard room with two queen beds and a twin size roll-away. When I looked at rooms “right in the middle of the city,” the daily rates were between double and triple per night from what we paid. We booked this room in October. The reservations fill quickly so I felt lucky to have a spot here. It was also nice to be able to leave our vehicle parked for the week. 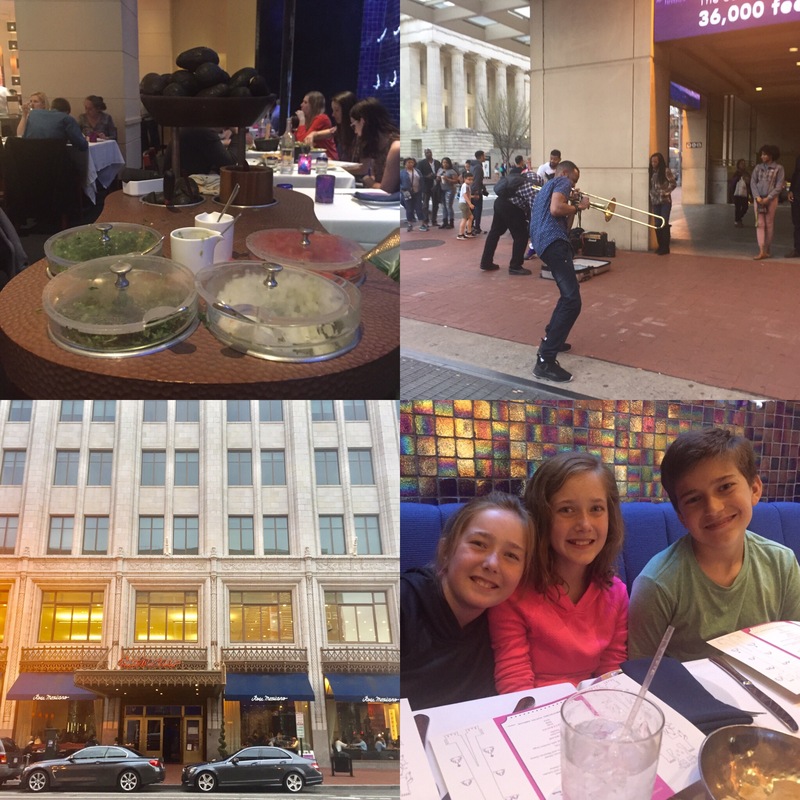 We did take it back out two nights and drove off the Walter Reed campus to eat dinner at some nice spots about two miles away in the downtown Bethesda area, also a fun area that bears exploring. I guess in a city like D.C. you’re going to pay for your conveniences one way or another. We didn’t have to pay for parking or an exorbitant room rate so we paid it in public transit fares. For all five of us to ride to and from the Medical Center stop four days (some trips during peak hours and some off-peak) plus a few other rides to get from place to place and save our steps, we spent $185 in total (each with $0.75 on our cards to spare). There may have been a cheaper way to get around but our kids would say riding and navigating public transit was one of their highlights of the trip. Other Metro considerations include: if you don’t plan well, you can spend some time waiting especially during non-peak hours. We barely missed the outgoing line from Arlington and waited another 28 minutes for the next one. Not an eternity but when the whole family is hangry a half hour feels like a lifetime. 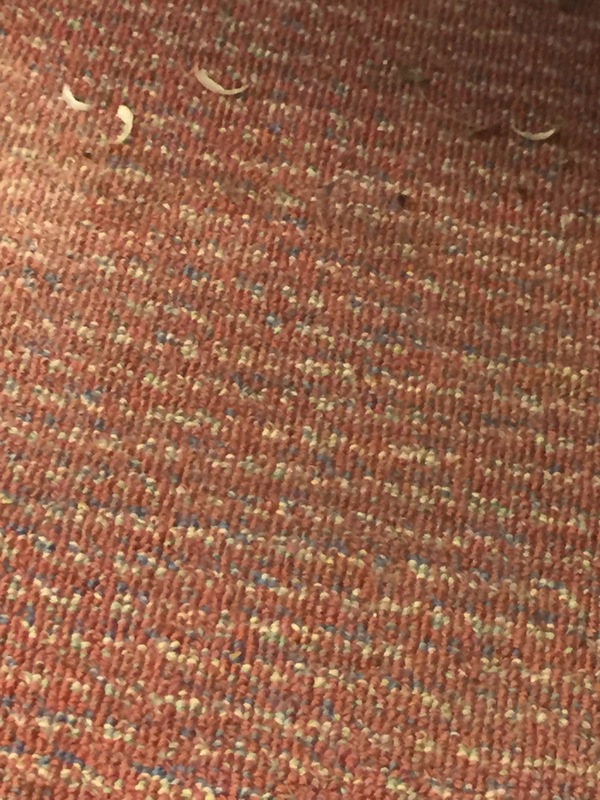 *Ryan clarifies that these were not *his* toenail clippings. There’s a very unsettling feeling underground on the platforms and when the trains take off. If riding backwards, being encapsulated in a dark-tunnel-like structure, standing on shaky ground, or feelings of vertigo bother you, the Metro will challenge your anxiety. It’s intriguing to people-watch on there. I was pretty obsessed with checking out people’s commuter habits. From their coats, shoes, work bags, and reading material you can glean a lot about a person. At one point a lady was knitting with two very large, very sharp METAL needles pointing right towards Ryan’s chest and major organ area. She wasn’t holding onto a pole, just awkwardly (barely) balancing on her feet. I was prepared to push her out of the way if she started to fall and potentially puncture Ryan in the heart. As you can see, my anxiety runs hot. Had our kids been much younger or especially if it had been just them and me, I am not sure how I would have handled the Metro. It would be easy for a kid to get lost in the shuffle. People are moving about fast; you either move with them or move out of their way. Ryan and I purposely tried to “bookend” the kids getting on and off the cars as well as on the platforms and escalators. At our kids’ ages, riding public transportation translates to a valuable life skill. I’m glad to see how confidently they had it all (mostly) figured out by day four. They knew the map and various lines, knew to move to the right on stairs and escalators to let the speedsters pass, and they stayed away from the edges of the platform. 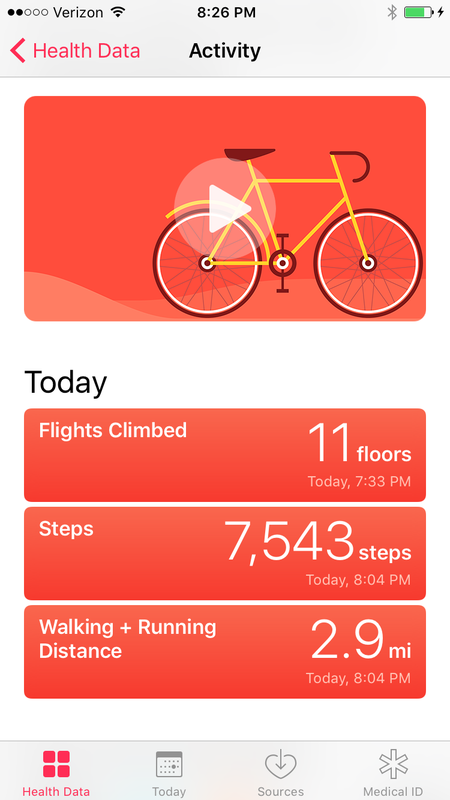 With all of our Metro riding over the course of four full days, we still managed to log over 54,000 steps and 22 miles. Our aging bodies sure are feeling it! Our dining out was By FAR our greatest expense on this vacation. It’s kind of like eating inside the park at Disney. You’ll spend $16.95 for a kids’ chicken finger basket because you don’t have any other options. And you will say thank you and eat it and enjoy it. Again, we could have probably planned better but we tend to be food snobs. We don’t particularly like to eat at restaurants we can eat at back home, although we try to stick to sure things like Chick-Fil-A or Cracker Barrel on travel days. While here we relied heavily on Yelp, Trip Advisor, and the solid recommendations of friends. Our basic formula was this: we are hungry and it is mealtime + what is the highest rated restaurant between where we are standing now and our next (Metro or attraction) spot + somewhere the little people will find a menu item they can tolerate = we have a winner. Normally Ryan and I love local, awesome places. 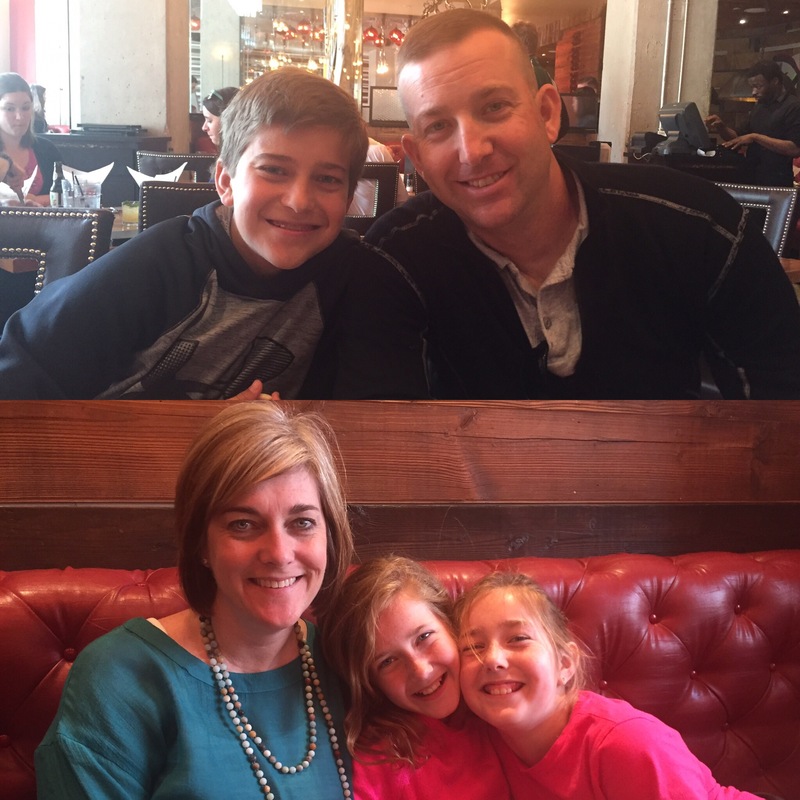 With the kids in tow, we needed burgers, chicken, pizza and no reservations required. Thankfully we had a fairly good amount of choices but you pay for that convenience. Most all of our lunches were $75 + and dinners were $100 + although we did have one or two meals that defied those numbers in either direction. We had a good free breakfast at the hotel each morning (oatmeal, waffles, yogurt, fruit, and decent coffee). I’d say on average each day we spent around $150 per day for good food. I’d recommend every place we ate. I’d guess I blew through another $75-$100 on bottled waters, coffees, cafe snacks to refuel, and other incidental snacks and drinks. Supply and demand is in full effect in the city. Again, I could have carried around all of this in a backpack but most attractions don’t allow you to bring in food and honestly, my back couldn’t take it either. WEAR PROPER FOOTWEAR. This is everything. And dress in layers because the weather can change throughout the day in April. Most mornings were cool, but by afternoon after hauling ourselves all over the city, we were sweaty and hot. (I wore my Nike tennis shoes, similar Merrell sandals I bought for Disney in 2009, and these similar black sandals.) The kids made due in either Chacos or their Nike tennis shoes. Skip a heavy backpack. You’ll think of a million things to tote with you. Don’t. Spare your back. Spare your time having your bag searched. Nearly every attraction requires security screening. We often skipped longer lines because we didn’t have a bulky backpack full of stuff to be searched. A large backpack is an invitation for the whole family to dump heavy water bottles, snacks, and souvenirs into the arms of one poor sucker willing to carry it. Nah! Wrong family! 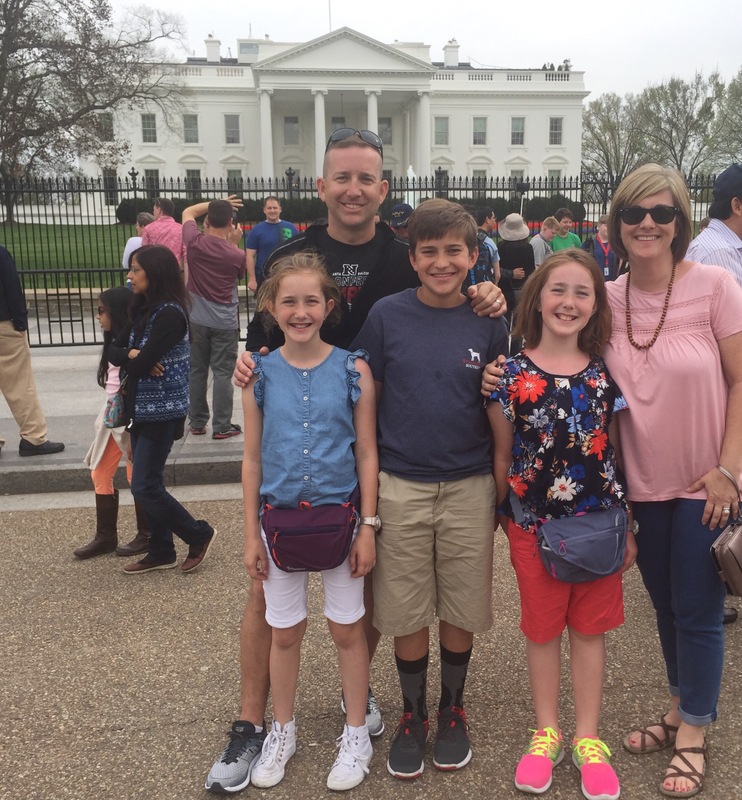 The girls kept a breakfast bar in their fanny/waist packs and the day at Arlington that went long, those were a life saver. Some mornings, they’d also add a tiny 8 oz. water bottle from the Navy Lodge. They’d sip on it and toss the empty bottle in the trash. 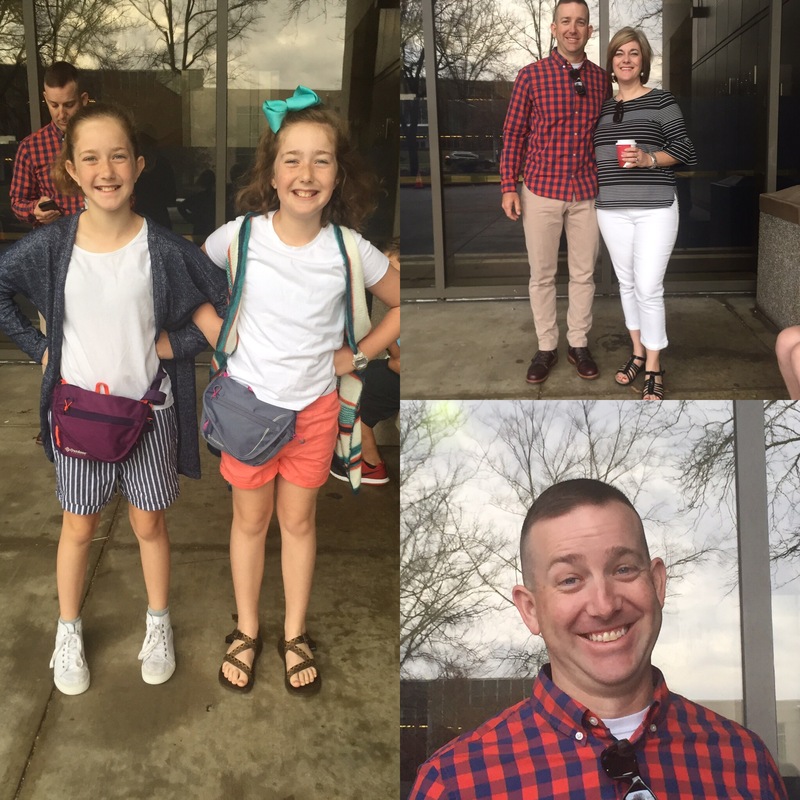 The girls loved having their fanny packs for carrying their money, a snack, and their Metro cards. Even small souvenirs fit inside nicely. I bought these as stocking stuffers at Christmas for travel, bike rides, and they have been THE BEST! I carried this wristlet and it is my favorite way to sightsee. 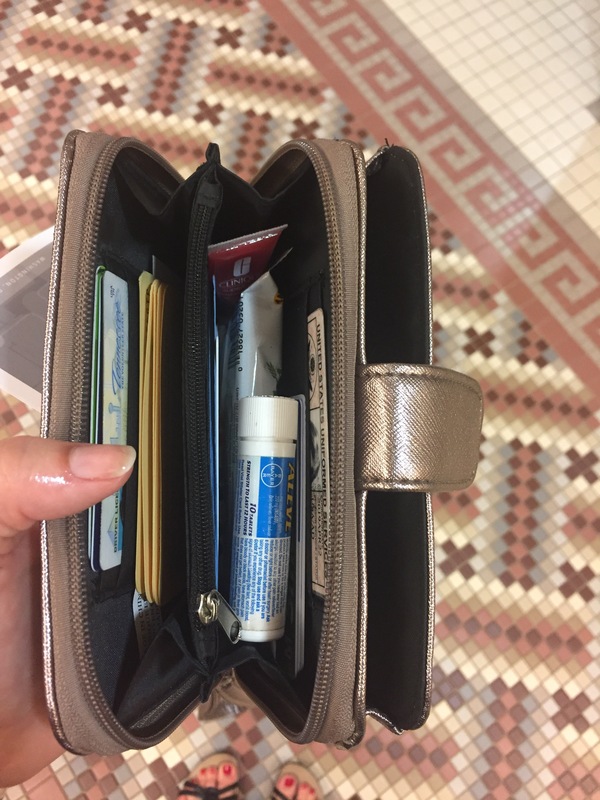 I had my debit and ID cards, Metro card and room key, some cash and gum, lipgloss, my little pill bottle with Advil and Benedryl, a Kashi bar, and an easy access point for my phone (camera). It was so light and easy to carry. The only things I wish I had included that I forgot were a bandaid and a few sunscreen wipes. Mae had a bleeding scratch that my friend Cortney happened to be able to help us with. A bandaid would have gone a long way to help a blister too. Thankfully no one ended up with a blister: see proper footwear above. Our kids brought their own earned money, cushioned a little by Mimi and Papa. It was nice to not have one single discussion about what they could/should–couldn’t/shouldn’t buy. Most of what they got was junk but kids love junk. 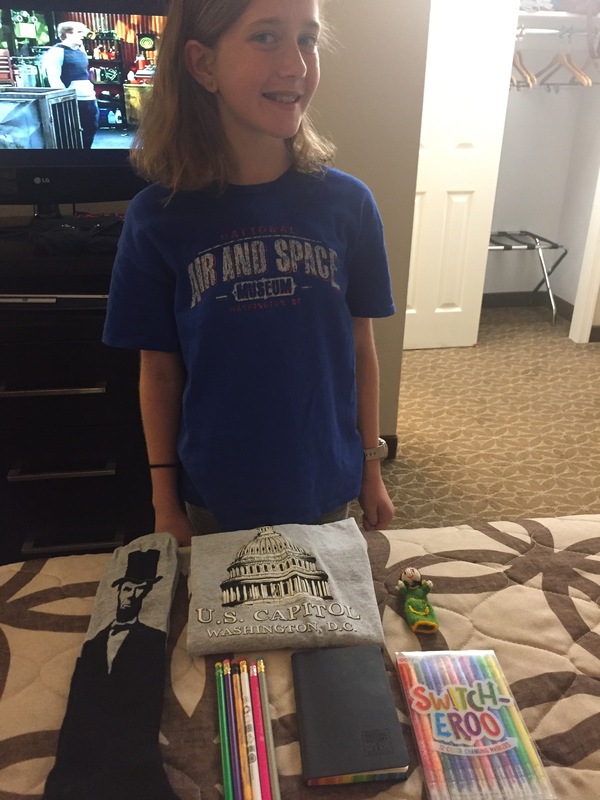 Thomas, Mae, and Kate had planned out how much they wanted to spend at each stop and some specific finds they wanted to bring home. For example, Mae wanted to buy an inexpensive pencil at each stop. Kate wanted a stuffed animal. Thomas mostly stuck with books. All I will say about their goodies is that they all fit their personalities and the apples don’t fall far from the trees. Well I’ll just go ahead and say it. There’s no way to see everything and do it all. And it pains me to say that. As someone who believes in the power of proper planning and being strategic, it is just not humanly possible to see everything and do it all. We had four full days and could’ve used at least forty more to squeeze it all in. I dare say there are RESIDENTS of D.C. who haven’t seen it all. When I started planning this trip I literally had over 45 items on my list. 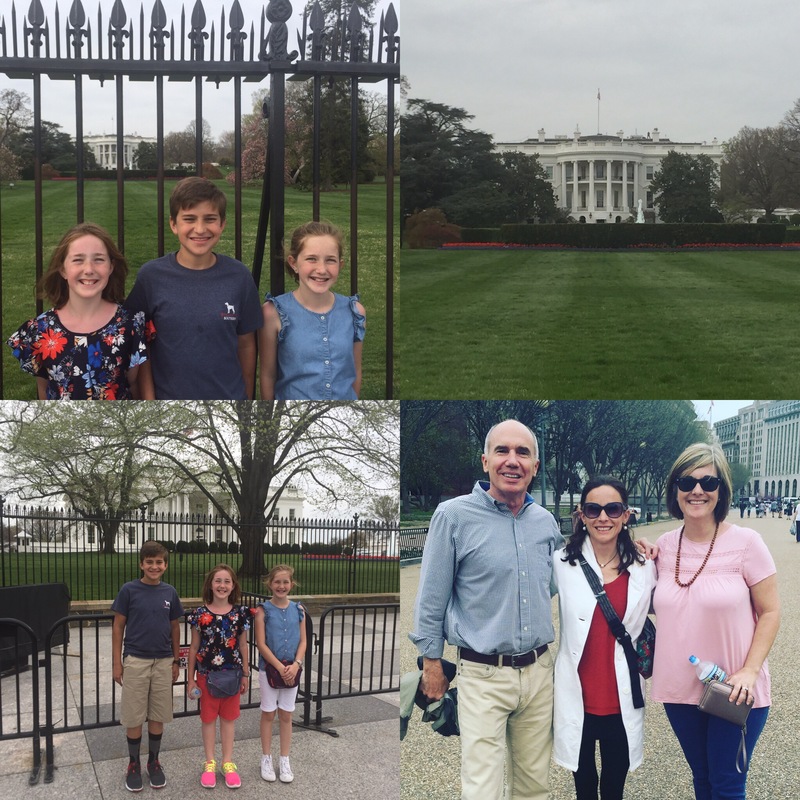 I started with the tours we could book with our congressional office and then began putting attractions in order of priority. Even still, we barely scratched the surface. We paid exactly $0 in admissions to the attractions we saw. 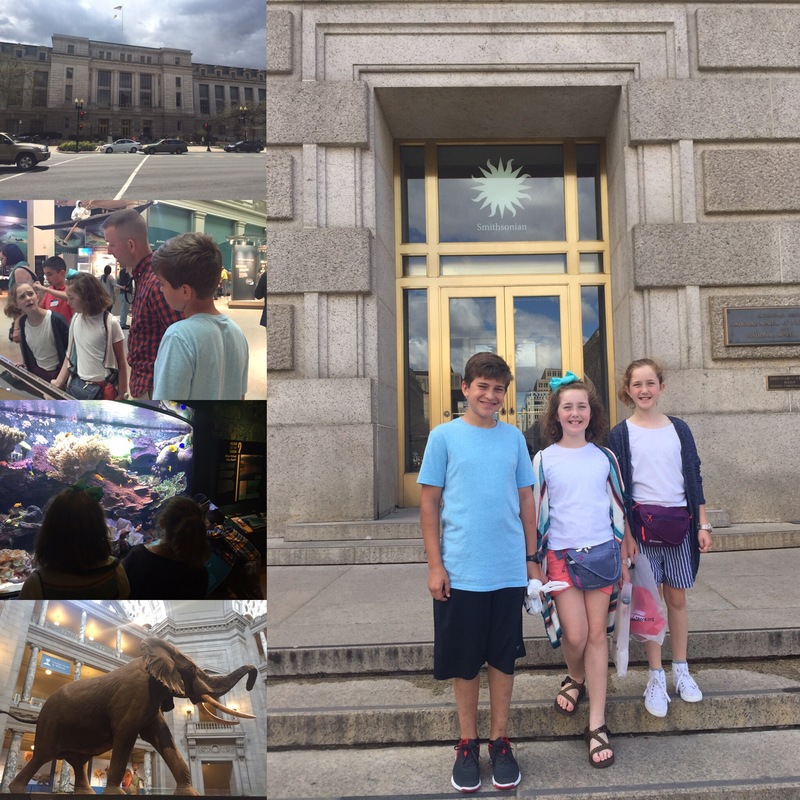 Admission is free in all of the Smithsonians, government buildings, and monuments. We found that our maximum limit at any one place was between 2.5-3 hours. 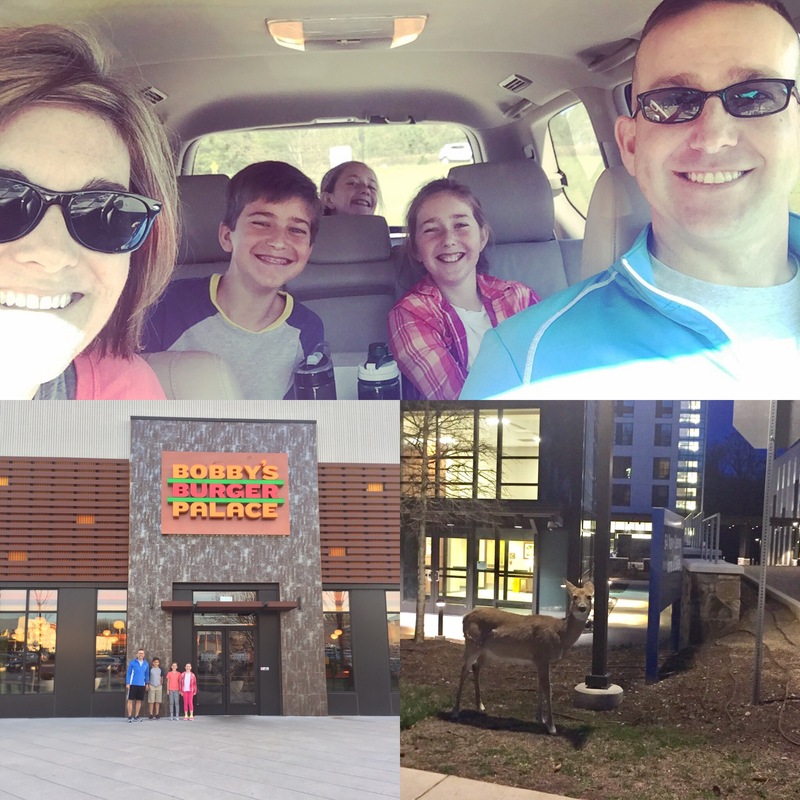 I was pleased with our kids’ interest and longevity at each place. 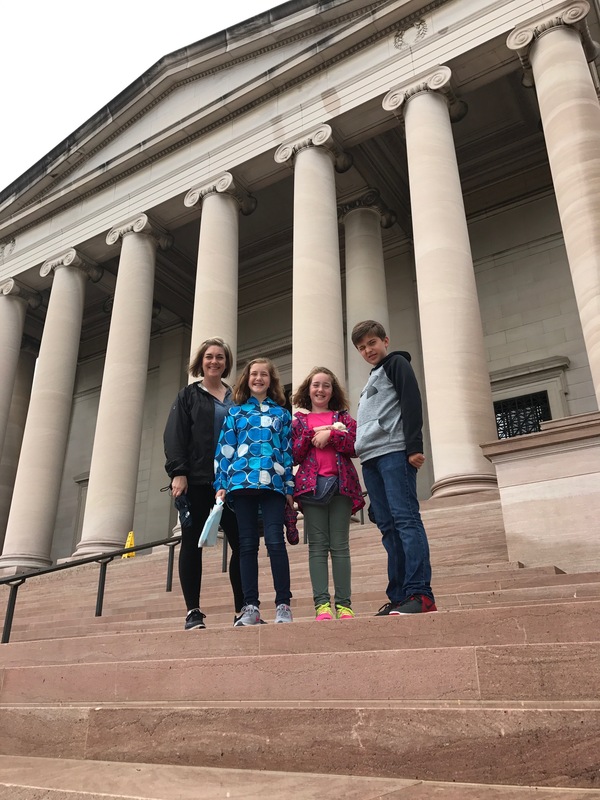 As a family, we have varying degrees of our “touring pace.” Some of us like to cover a lot of ground and get a big picture overview of each museum while others would prefer to read every word on every placard at every single object or exhibit. We’d often try to communicate those expectations before we set foot inside each place. It was helpful to get inside, get a quick glimpse of a brochure/map and prioritize which exhibits we wanted to visit most. Knowing the game plan kept things moving smoothly. Some of us can go all day without a meal and others need frequent bites to keep energized. 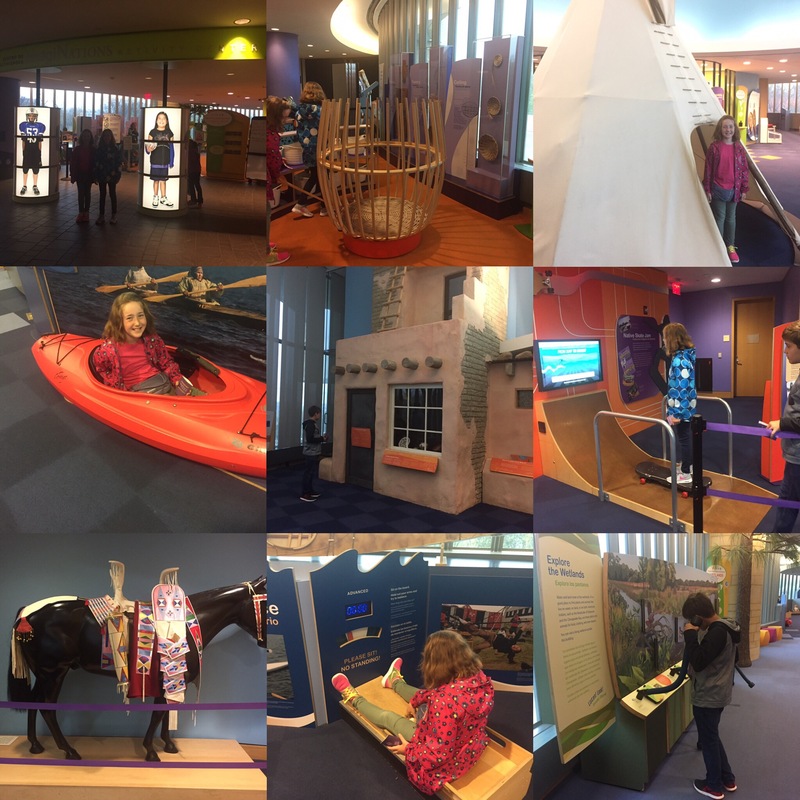 Some of us enjoy the kids’ areas of the museums best while others prefer the gift shops and could stay in there for hours making their decisions. Sometimes we were all together and other times we divided and conquered. We tried to sit or stretch when we needed a break. Oh and the potty breaks. When your mother forces you to over-hydrate, there’s gonna be lots of potty breaks! I only accused Ryan of being a jackass in earshot of the kids once, and he only fussed at and scolded me a few times too. Only a few people cried. Only a few occasionally complained of being tired and weary. In all we tried to show lots of patience and grace and flexibility towards each other and our plans. On a trip like this, it’s a must! 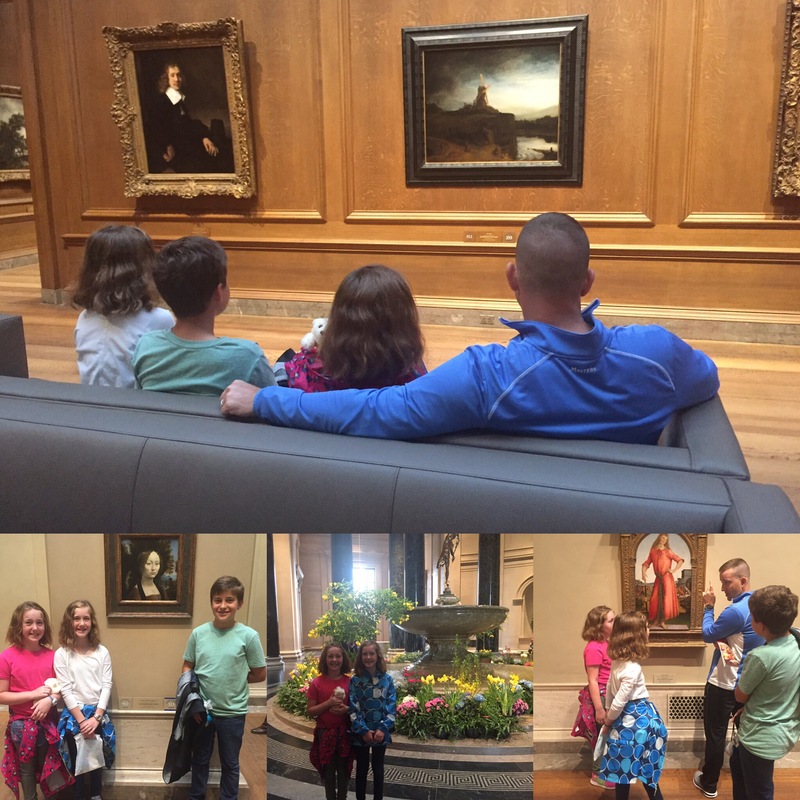 My blog, my prerogative so I’ll add honorable mentions: National Gallery of Art, bumping into lots of folks we know, and just being in D.C. with my four favorite people. 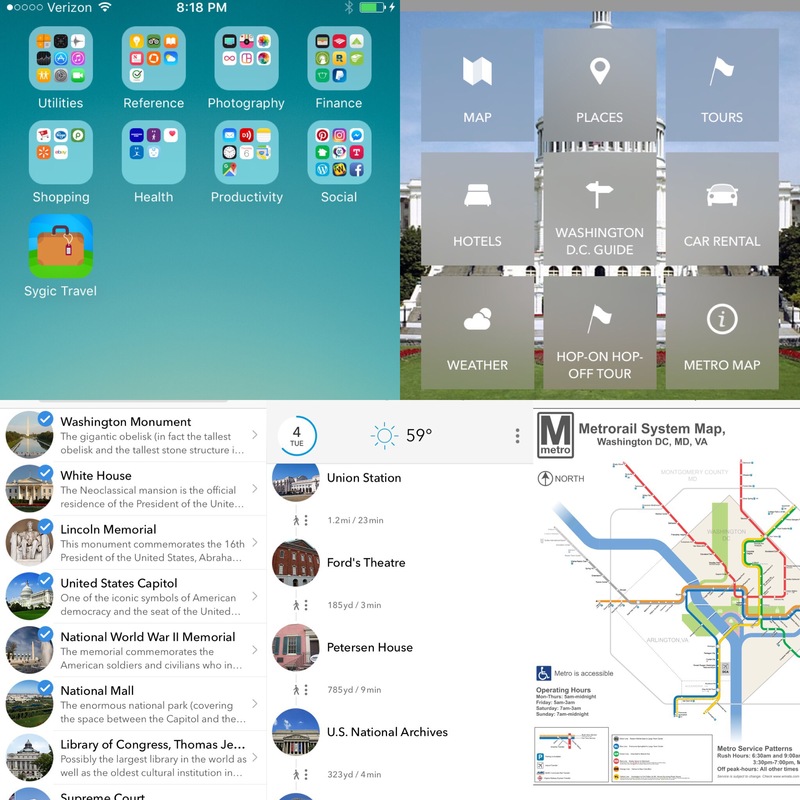 The number one thing that was so helpful once we got here was using the Sygic Travel free app (the stand alone app on my home screen in the photo below). It allows you to create a trip, put in your dates and location and then search attractions. There were over 500 places listed on the D.C. Location and they are ranked in order of popularity. You can go in, select attractions/places and build them into particular days. It adds up the time and distance of each one to help you be realistic about your day. This helped us to be geographically strategic and I believe, cover more ground efficiently. The app also shows you distance and travel time between spots. 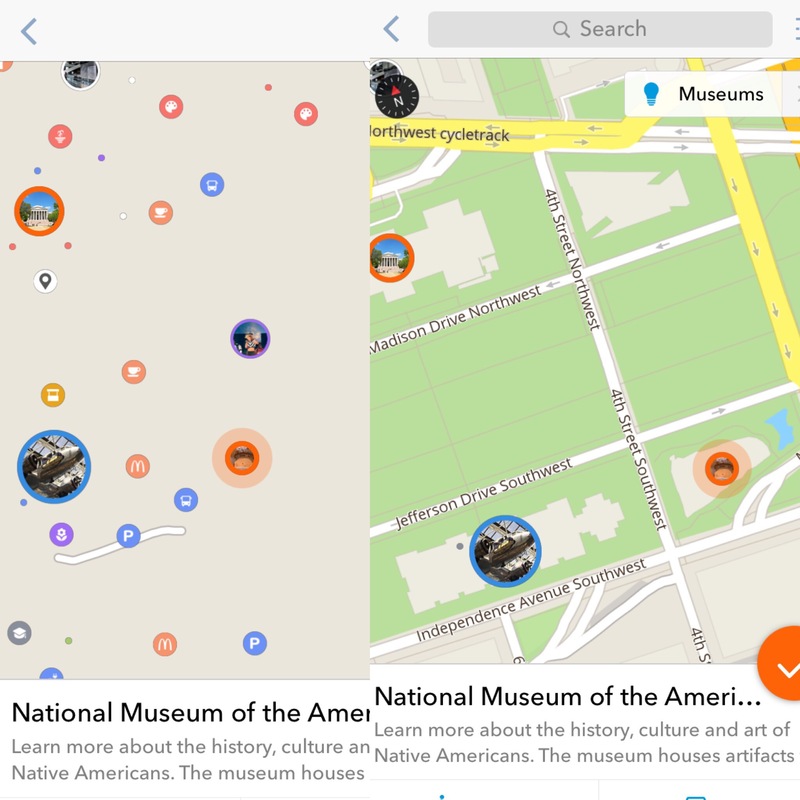 It will allow you to search by museum, transit, or monument. At any moment I could quickly glance to see what was nearby. I also love the feature that allows you to deep dive each locale. You can see approximate time to allocate there, hours of operation, and admissions info. Super valuable!!! Some people like to lollygag and see where the day takes them. Those people are not named Claire Wood. Without a plan this city will overwhelm you. This app was crucial in our planning. We planned out the week and as each day wore on, we’d update our day. At the end of each day we’d move a few more things around. We knew upfront we’d never see it all so this app helped us to keep our list prioritized. 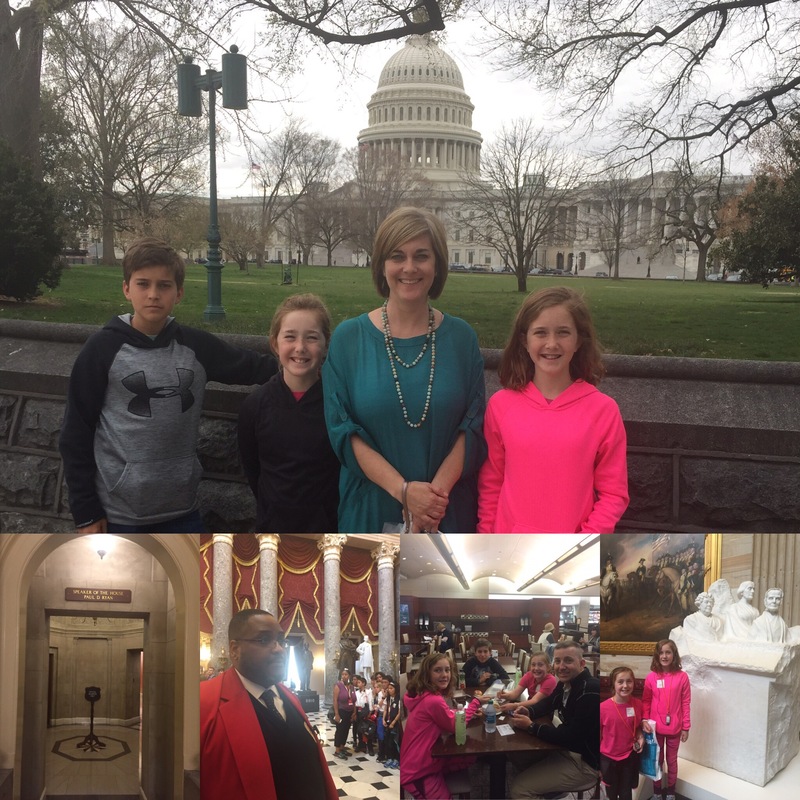 We booked several tours through our congressional office. If I had to do it again, I wouldn’t bother. Those hard and fast times were super stressful and really pigeon-holed us in on time and location. Our White House tour was cancelled and we never made it to the Supremee Court or Bureau of Engraving and Printing. All of those places you can just walk in and join a tour at your discretion. The only tour time we kept was the Capitol tour on Monday. We toured it with thousands of other people, nothing special because of our preset tour. Here’s my biggest tip on this tour. 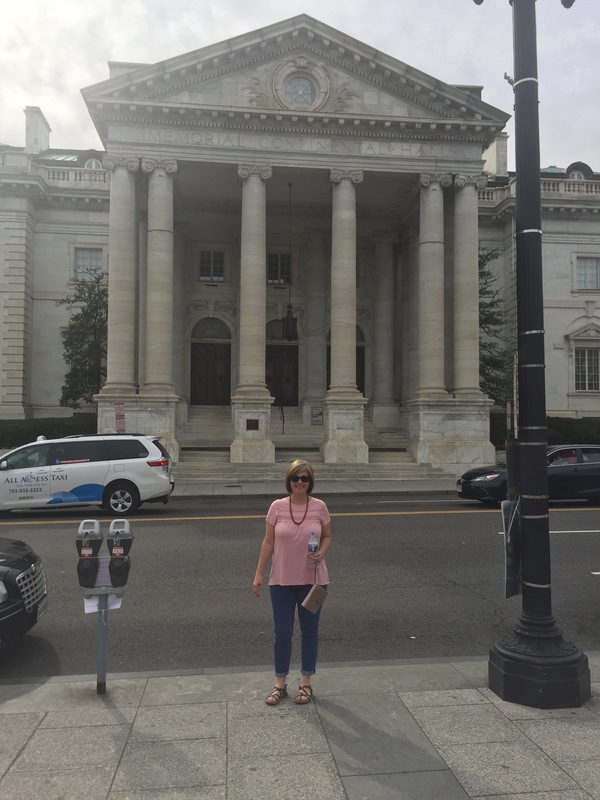 When the tour ends, they drop you off near the congressional and senate galleries and say, if you want to see these, walk across the street to the senate offices and ask your senator for passes. No! Do this instead: before you set foot inside the Capitol building, go find your senators’ building, get those passes, THEN tour the Capitol. When your tour ends you’ll have those gallery passes in hand should you want to sit in a session. I’ve decided that I feel about a trip to Washington, D.C. the way some people feel about a Disney vacation. In many ways, it’s a similar experience: lots of walking, too much fun to process all at once, and expensive. I am so glad we made this trip a priority. Our kids are 13, 11, and 9 and said this was one of their all-time favorite vacations/trips/cities of any we have ever done. I can’t speak to what it might have been like with much older or much younger kids. We saw families of all shapes/sizes/ages. You know your kids best and what they are capable of handling. 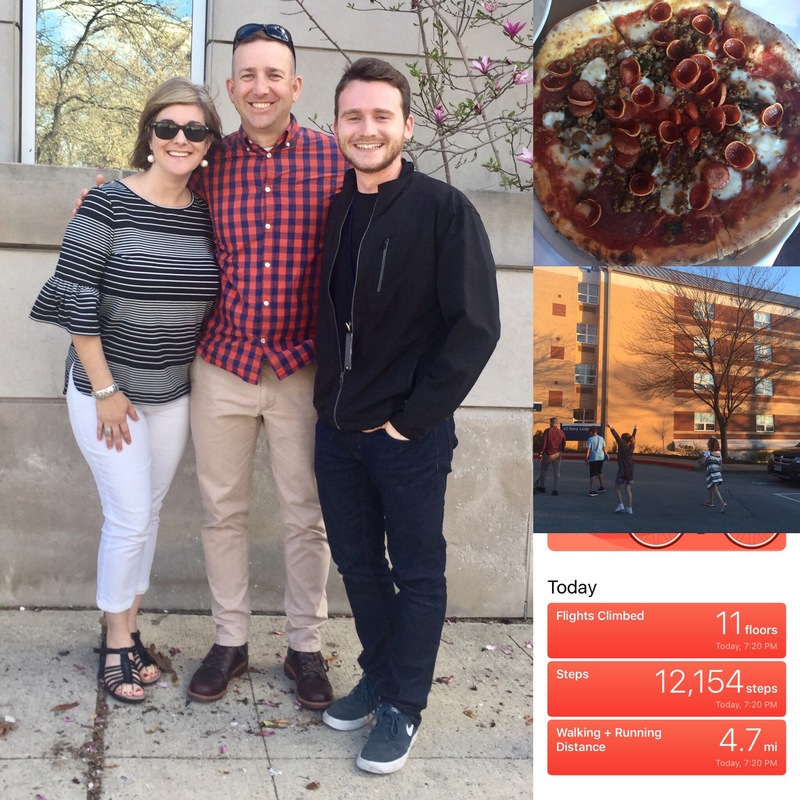 Ryan and I made the trip alone in November of 2015 and it was a whole different experience (using Uber, staying downtown, choosing better restaurants). I say, keep in mind your audience and plan accordingly. 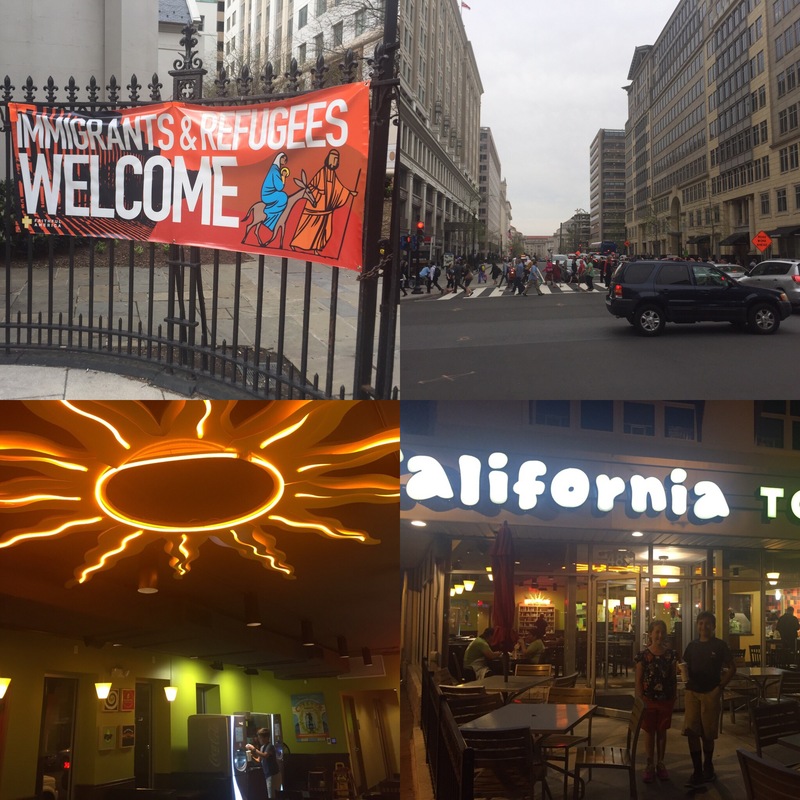 If you’re on the fence about making a trip to D.C., just do it! It was awesome and one we won’t soon forget. In fact, we are already talking about when we might make it back again! You rock! Such great info! Saving this for our future trip!!! !